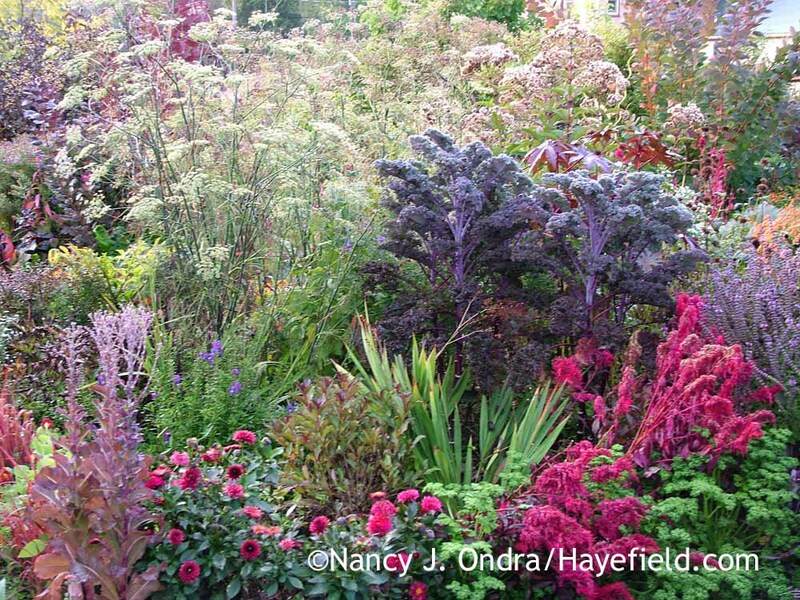 There’s no shortage of flowers for fall, and they’re all welcome for fresh color at a time when many plants are on the decline. The three I’ve chosen here are particularly late to open, usually peaking in mid- to late October here in southeastern PA. 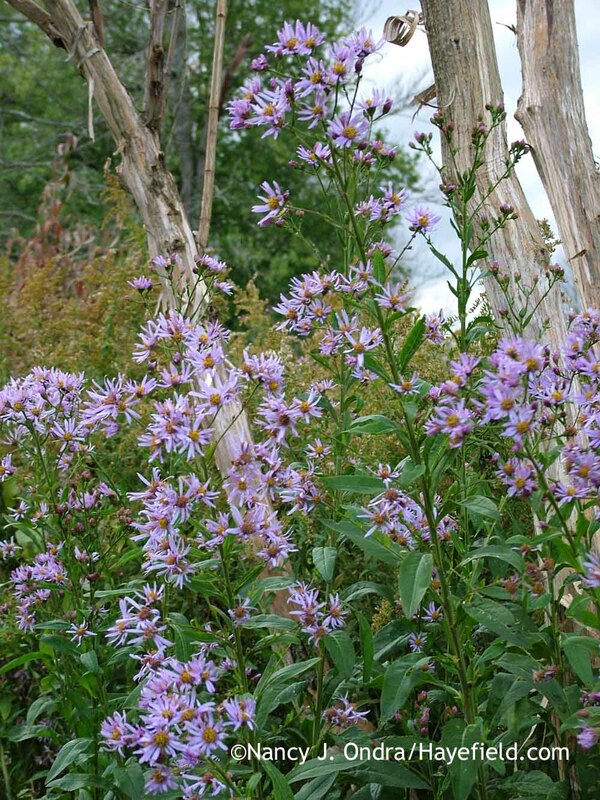 Unlike our native asters, which have been reclassified into a number of other genera, Tatarian aster is still an Aster: specifically, Aster tataricus. The general consensus seems to be that the species reaches 6 to 8 feet tall, but listed heights for the “dwarf” selection ‘Jindai’ are anywhere from 3 to 6 feet. I suspect that most places sell the cultivar, even if they list it as the species. I’ve had what is supposedly ‘Jindai’ reach 7 feet tall in rich, moist soil and divisions from those same plants consistently reach 3 to 5 feet tall just a few hundred feet away, in drier conditions. Even within one patch, the stem heights can vary widely. 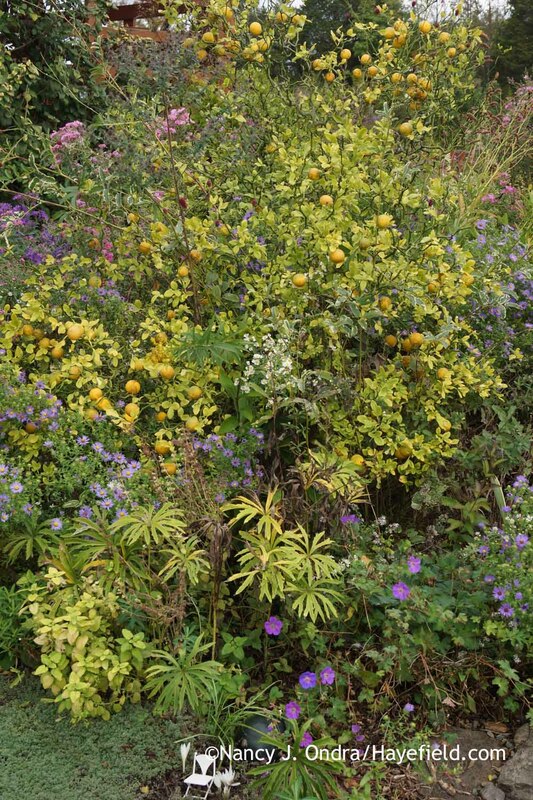 You’ll just have to try it for yourself and see how it performs in your particular conditions, but it’s fair to assume it’s a back-of-the-border plant pretty much anywhere it’s hardy (generally Zones 3 to 9). 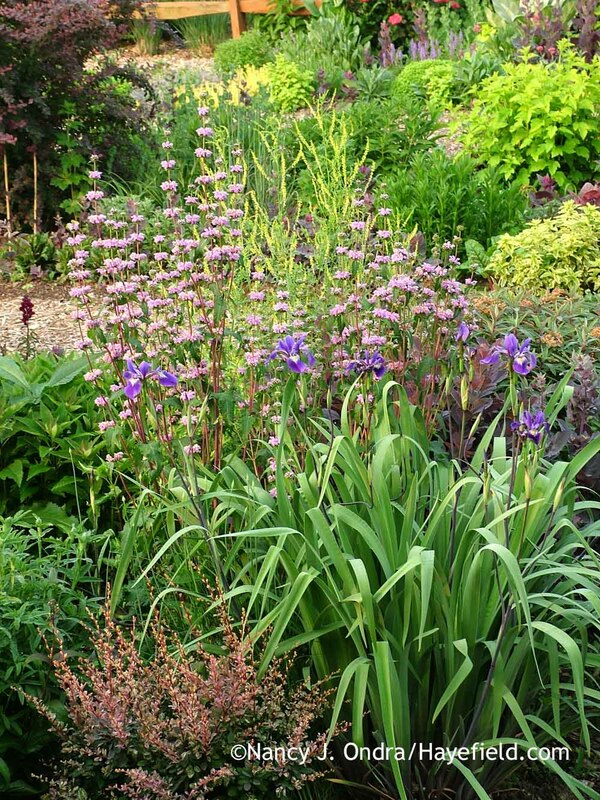 You also need to be aware that it spreads to form broad patches, so it’s a not a good choice for a small garden or a tightly controlled formal border. 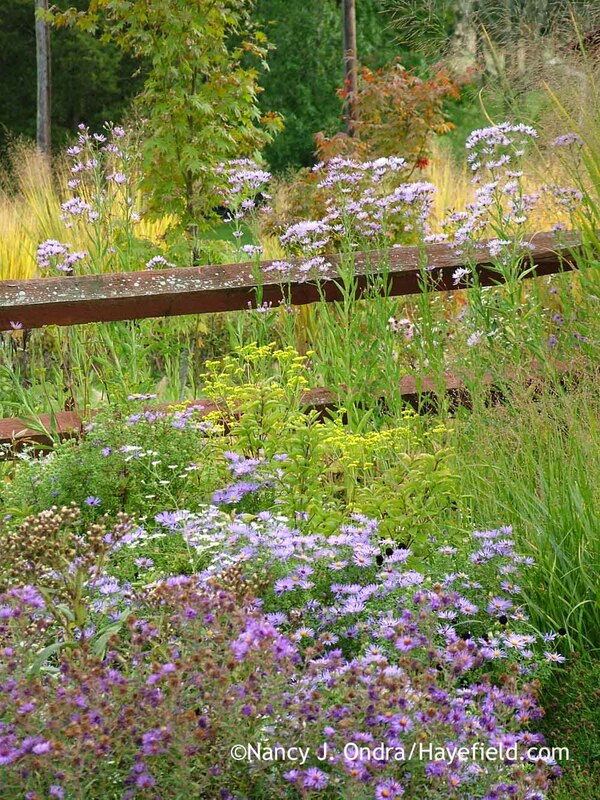 Where Tatarian aster really shines is in combinations with late-flowering or fall-colored deciduous shrubs and trees, or paired with tall, warm-season ornamental grasses, such as switch grasses (Panicum). 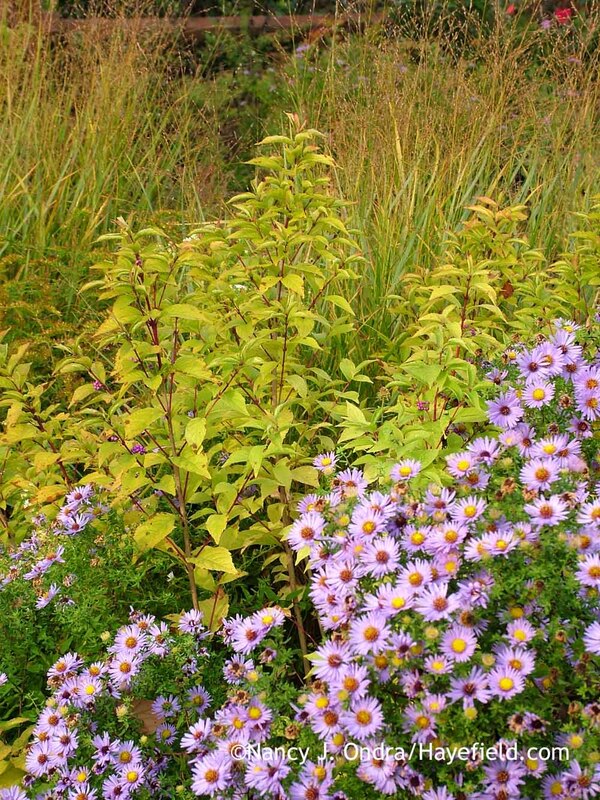 In this part of Pennsylvania, Tatarian aster usually starts flowering in the first or second week or October and continues until late October, or even well into November if we don’t get a hard freeze. 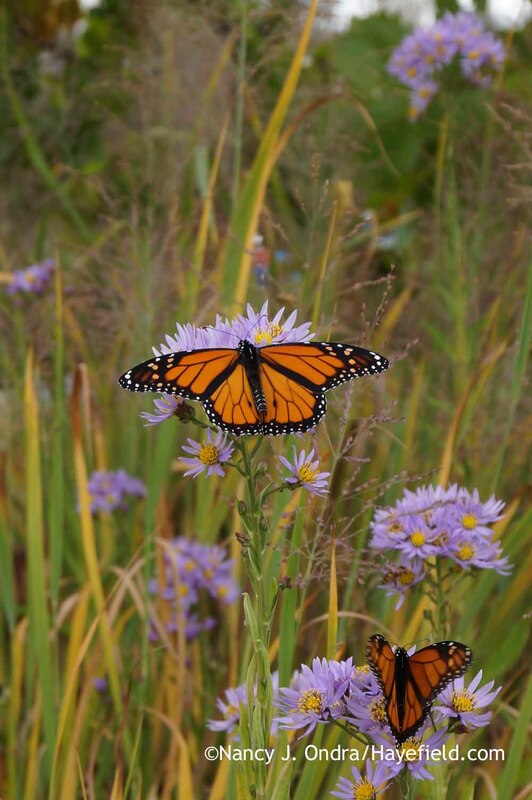 I often see it loaded with bees and butterflies, as it’s usually one of the very last flowers in bloom. 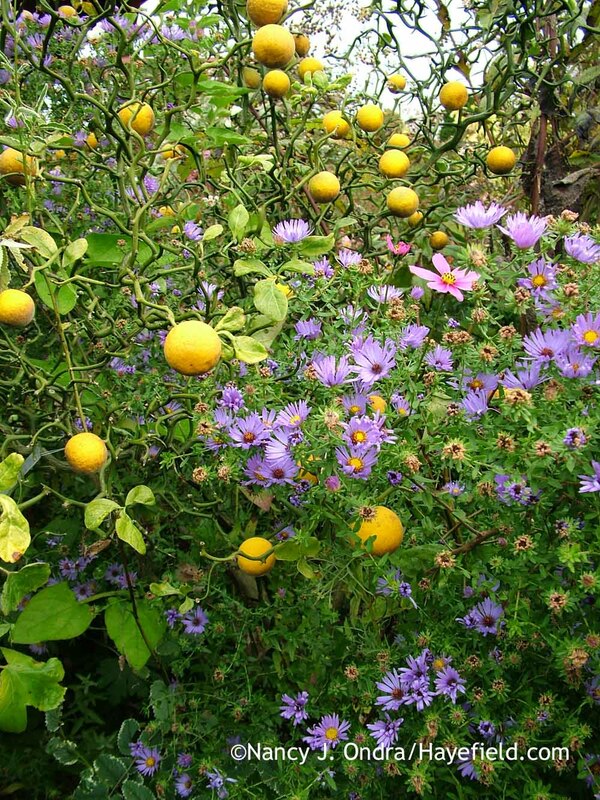 Some sources for ‘Jindai’ Tatarian aster include Digging Dog Nursery, Lazy S’s Farm Nursery, and RareFind Nursery. 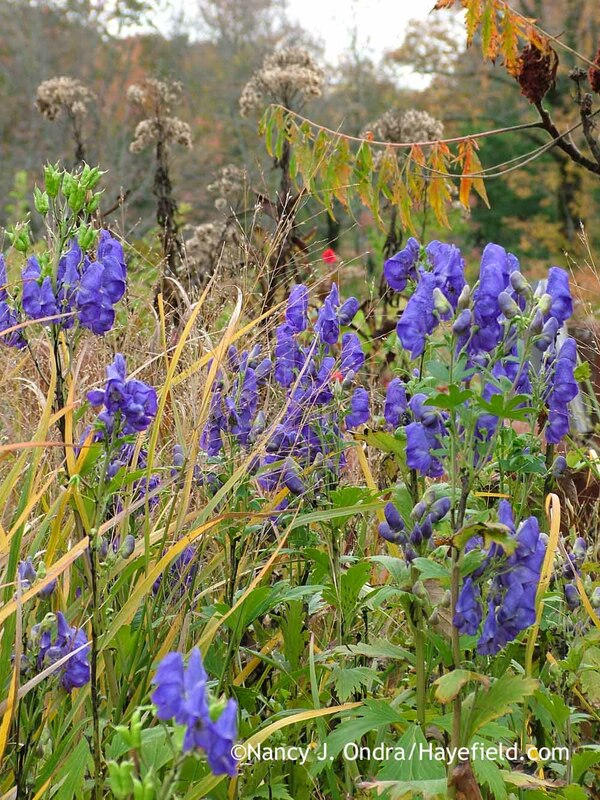 Azure monkshood (Aconitum carmichaelii Arendsii Group) is another gem for tall, mid-fall flowers. 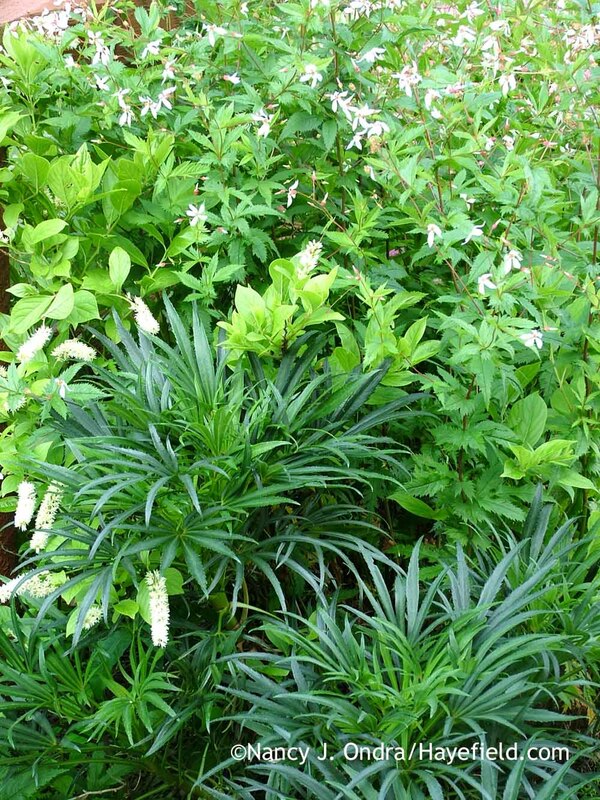 Though it’s among the last perennials to bloom, it’s among the first to send up new leaves in spring. 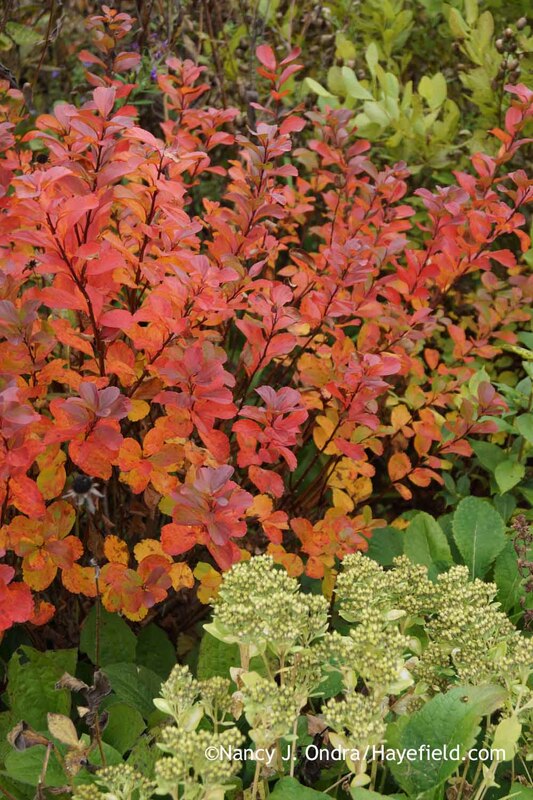 The deeply lobed leaves start out tinged with red but quickly turn bright green as the spring progresses. 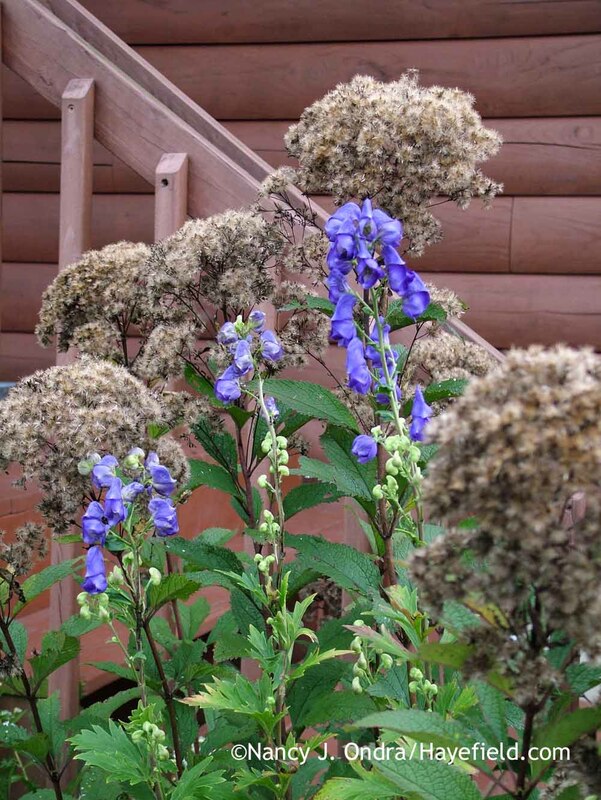 Finally, the hooded blooms open in late September to early October. 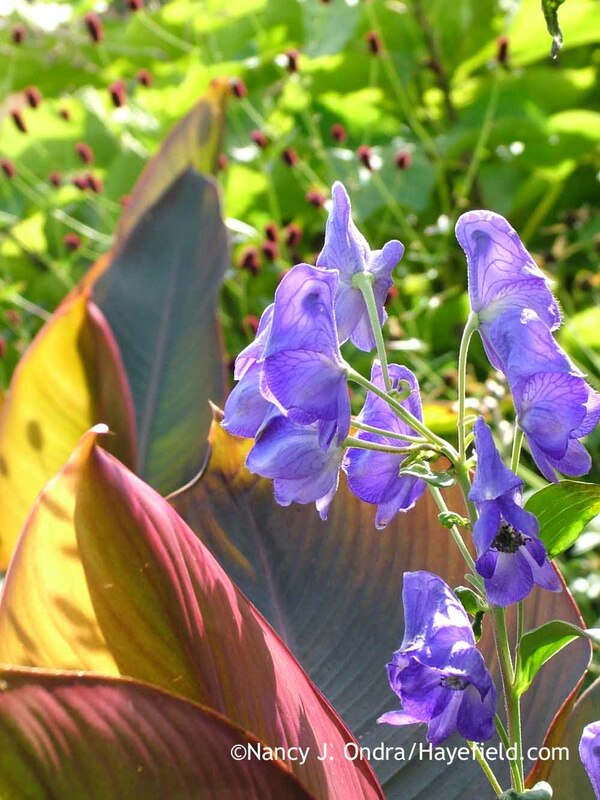 They are usually a rich purple-blue, but the intensity can vary. They are distinctive among the more common reds, oranges, yellows, pinks, browns, and blacks of the season. 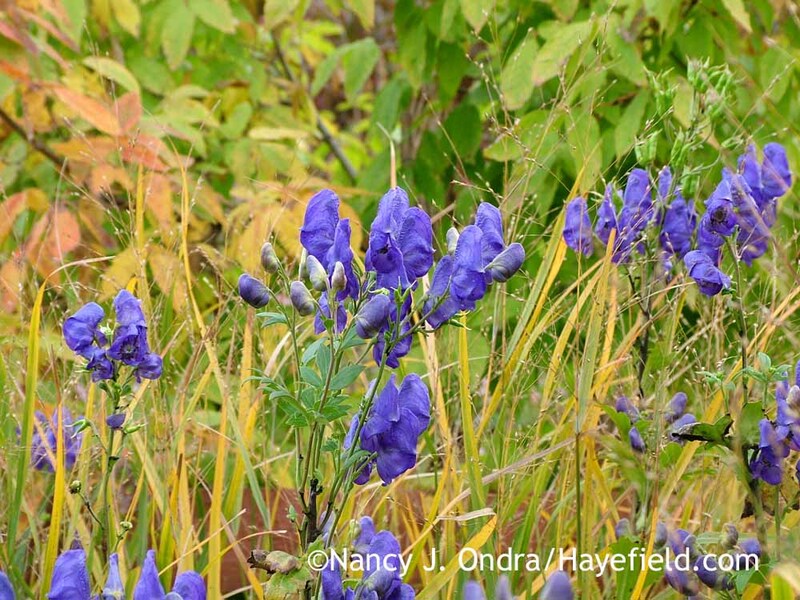 Like Tatarian aster, azure monkshood is tall enough to show off well against fall-colored trees, shrubs, and grasses. It’s much less vigorous than that other late bloomer, though: never a thug. 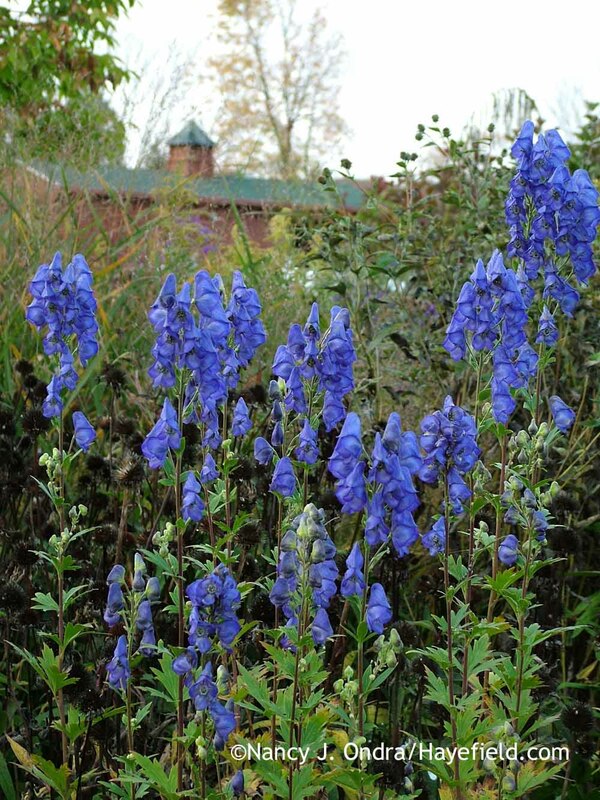 There’s distinct variation in the height descriptions of plants sold as Aconitum carmichaelii ‘Arendsii’ or Arendsii Group: Some say 2 to 4 feet, some say 3 to 4 feet, and others claim 5 to 6 feet, which is about how tall mine get. 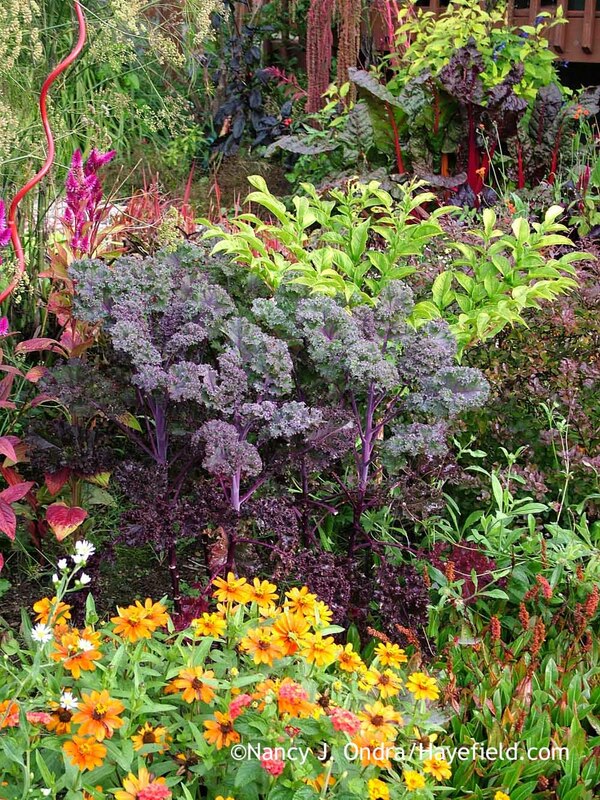 You may have to try a few plant or seed sources or experiment with different planting sites if you want a particular height range. 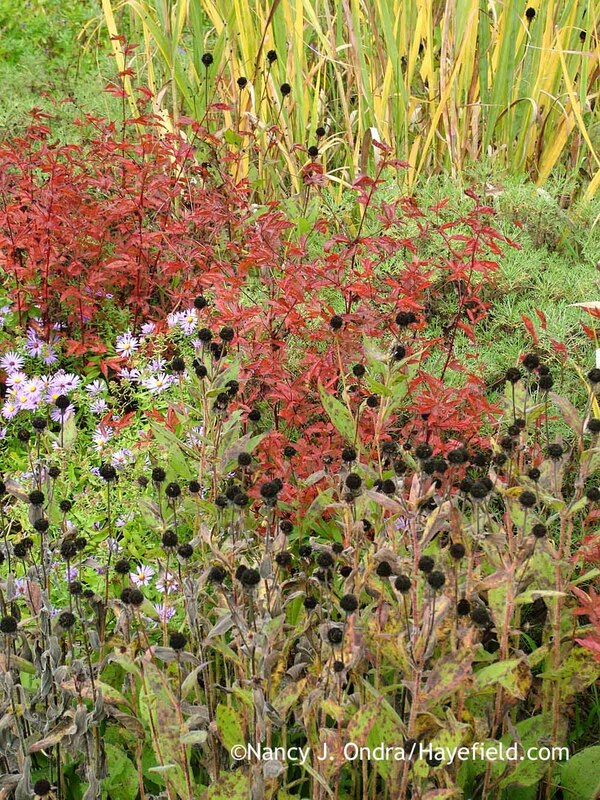 A couple of plant sources include Digging Dog Nursery and White Flower Farm; for seeds, try Plant World Seeds. My third pick from the late bloomers is a short one: ‘Ozawa’ japanese onion (Allium thunbergii). 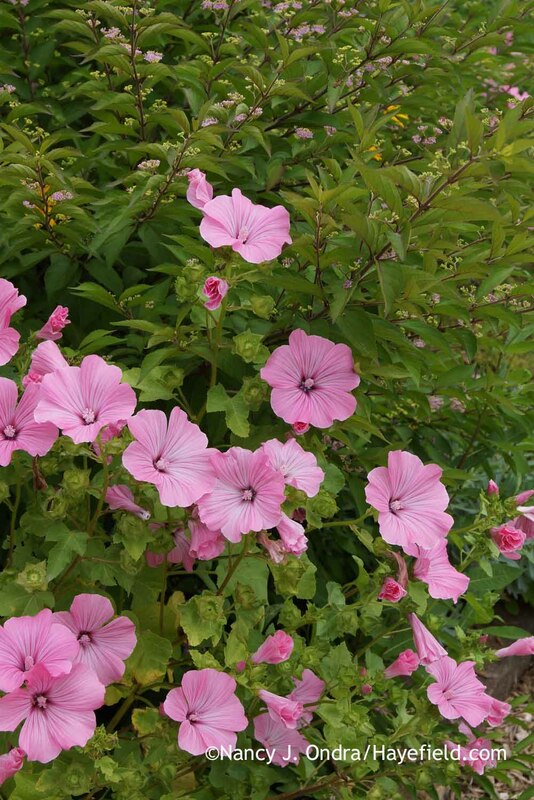 At about 9 inches tall in flower, this one is small enough–and well-behaved enough–to fit into pretty much any garden. 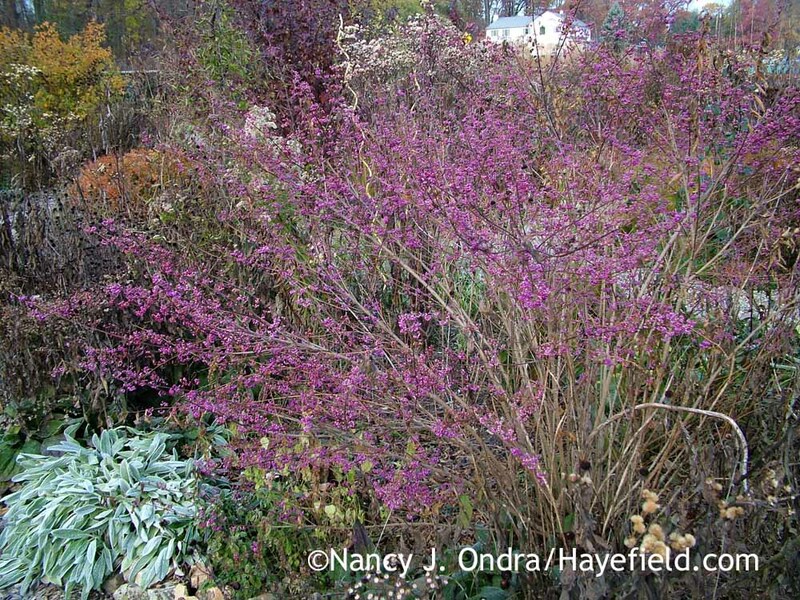 It’s always a surprise to see the purplish pink flowers open in October, since the plant is easy to overlook during the growing season. In fact, its clumps of slender leaves look so much like weedy wild onion that you may want to leave its label nearby so you don’t pull it out accidentally. Which…um…explains why I don’t have this plant growing here right at the moment. I plan to reacquire it as soon as possible, though. A few sources that currently have it available include Klehm’s Song Sparrow, Lazy S’s Farm, and Quackin’ Grass Nursery. Another ornamental feature of ‘Ozawa’ Japanese onion is the rich orange fall color of the foliage (just starting to develop in the shot below). Pink and orange together during the growing season can be a little jarring, but at this time of the season, any last bits of color are welcome. 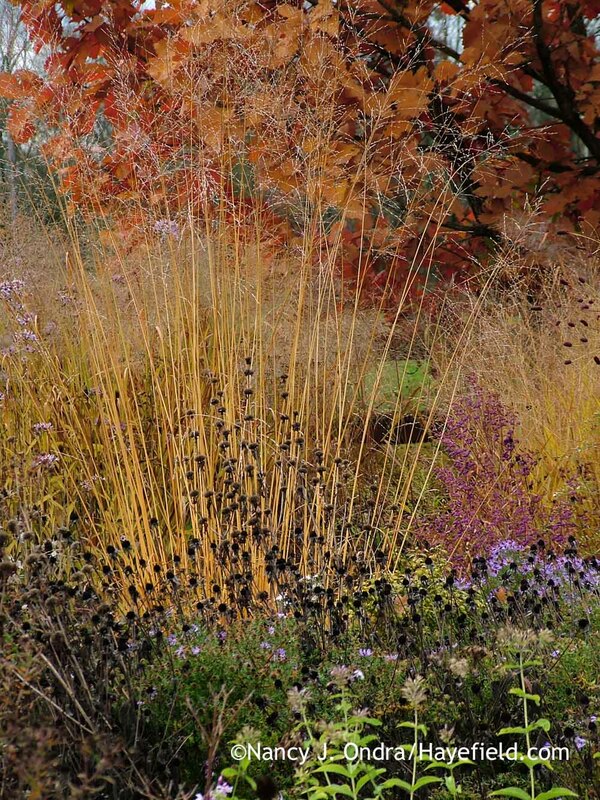 Oh, how to choose from among the many superb seedheads? 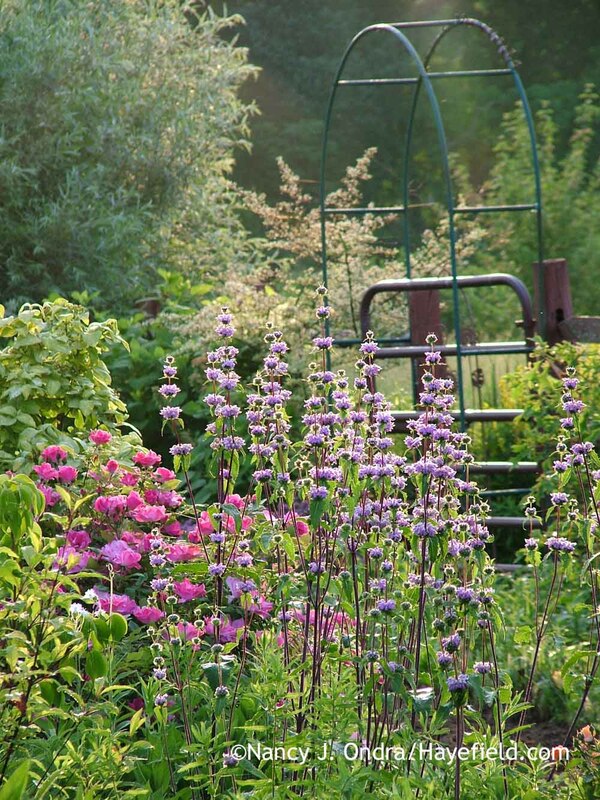 Well, one that’s a particular favorite of mine comes from a perennial that’s also beautiful earlier in the growing season: tuberous-rooted Jerusalem sage (Phlomis tuberosa). 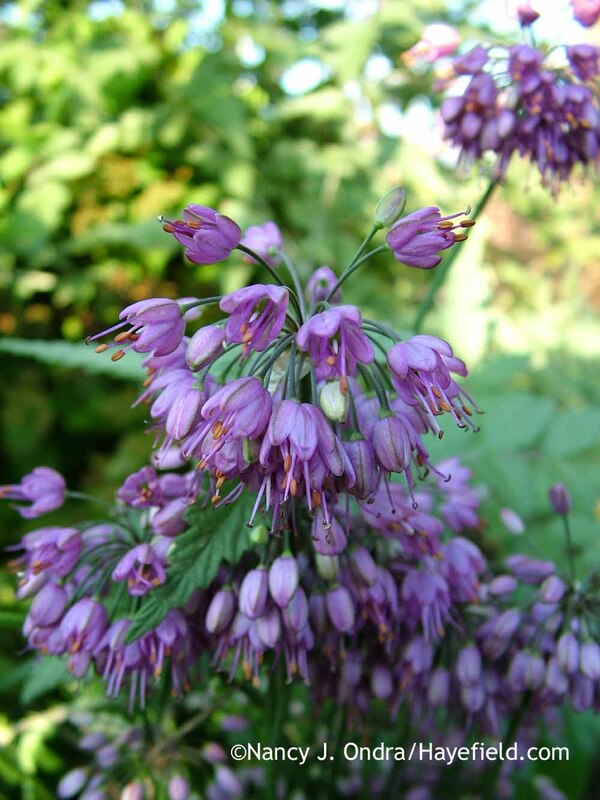 The common name isn’t elegant, but the plant is, with tall stems that carry whorls of lavender-pink flowers for a few weeks in early summer. 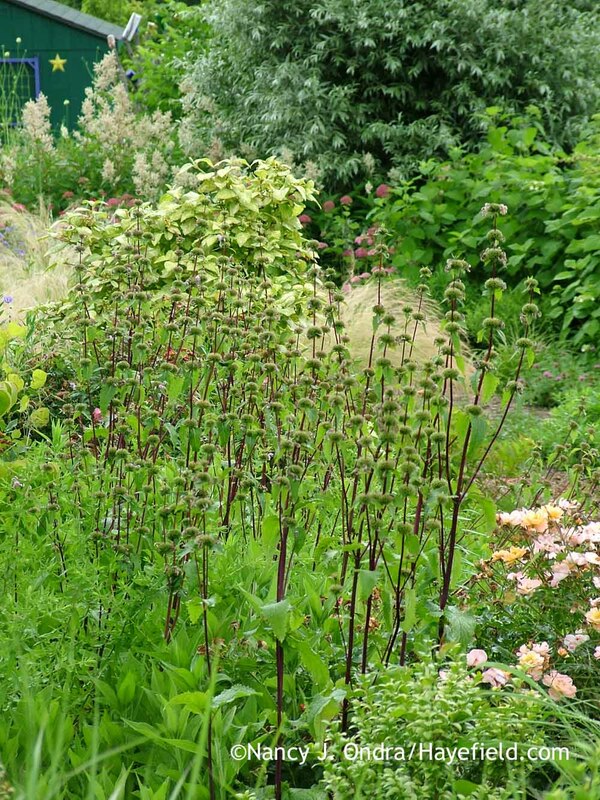 Once the flowers are finished, it can be tempting to trim off the spent stems, especially when they’re turning brown just as other colors are heating up in midsummer. 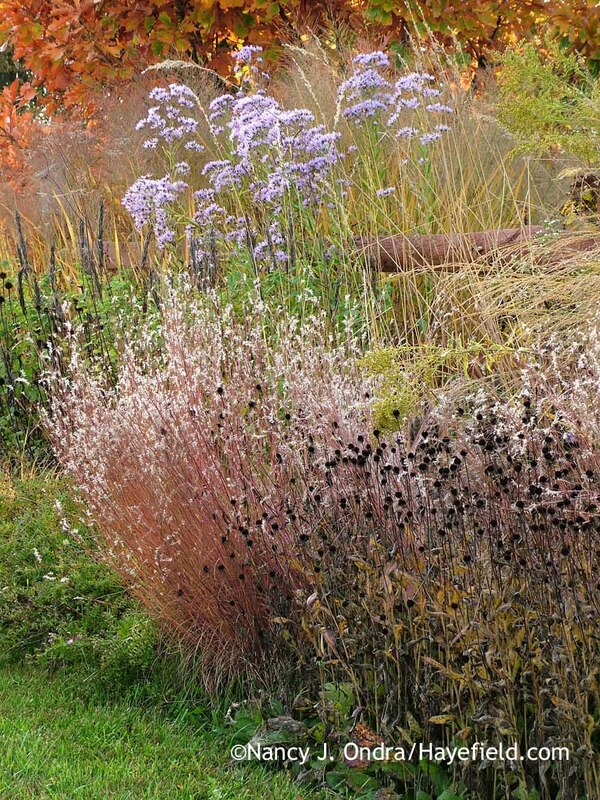 But if you can keep your clippers off them, I think you too would enjoy their striking form in your late-summer and autumn garden, with tall grasses, fall-colored foliage, late-flowering partners, and other striking seedheads. 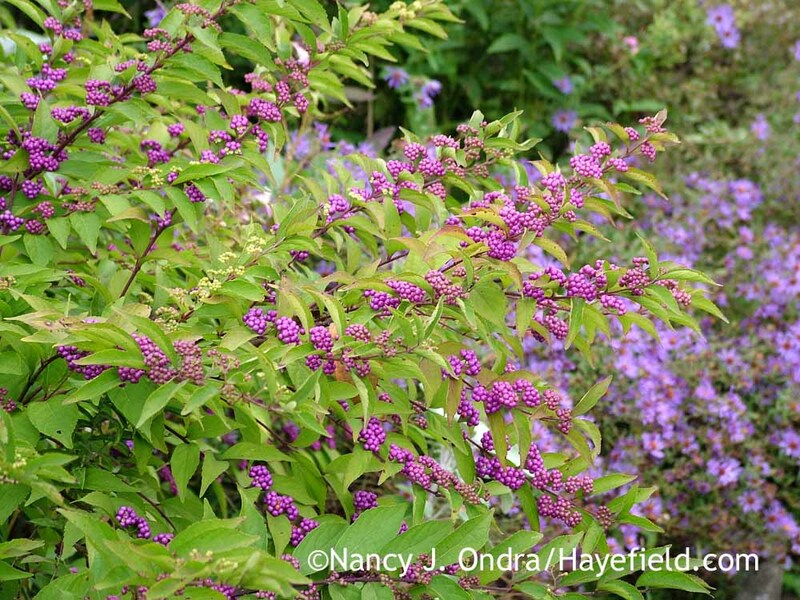 If you’re not into appreciating seedheads, perhaps the beautyberries (Callicarpa) would be more to your liking. I’ve tried a few of these deciduous shrubs here and have the best luck with the species C. dichotoma. 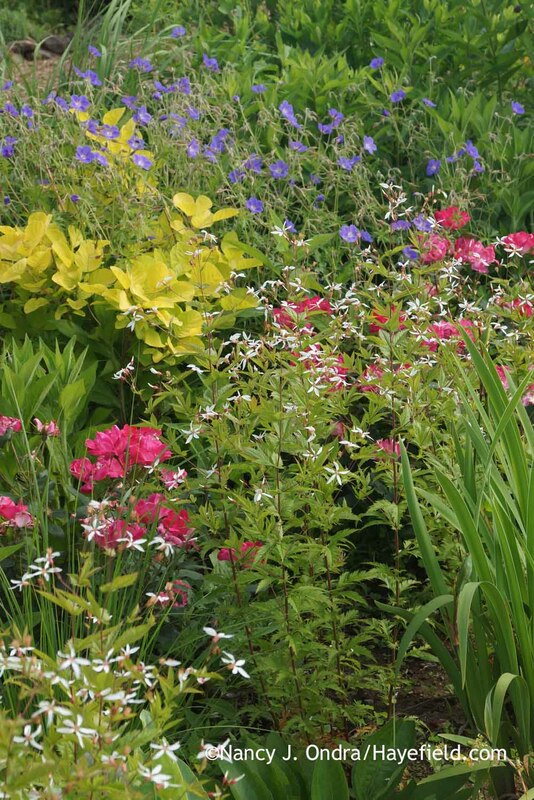 I cut it back to about 4 inches every spring, and it fills out to 3 to 4 feet tall and wide by fall: a nice size for a mixed border or foundation planting. 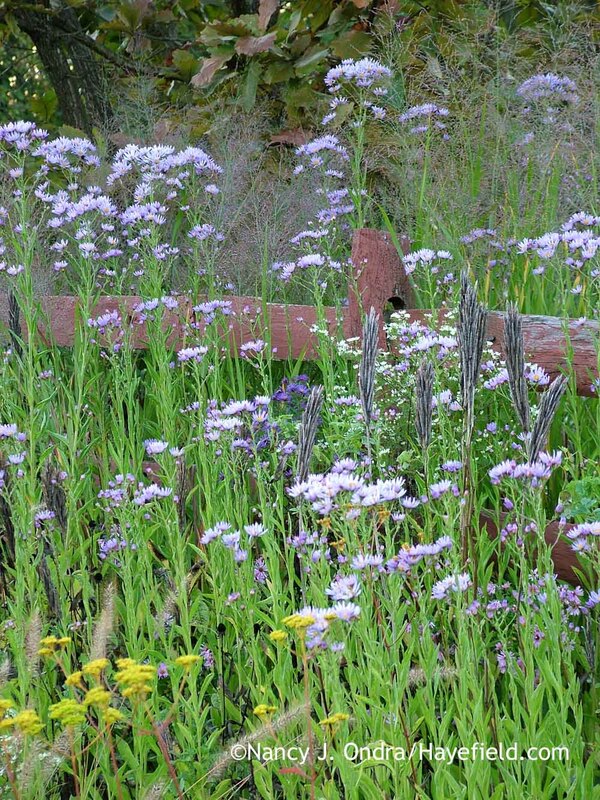 Clustered flowers appear along the current year’s growth in mid- to late summer. They’re pretty but not wow-inspiring. 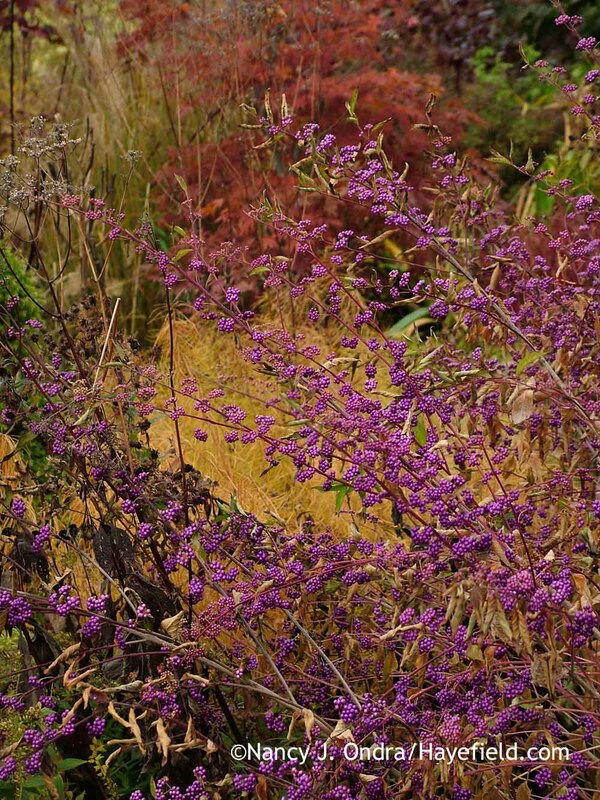 The fruits of ‘Early Amethyst’ usually color up in early fall, while ‘Issai’ is at its purplicious peak here in late September, October, and November. There’s also a white-fruited version of C. dichotoma, sold as ‘Albifructus’ or C. dichotoma f. albifructa. While the berries of C. dichotoma are still doing their thing, the leaves develop their yellow fall color, adding even more to the seasonal show. 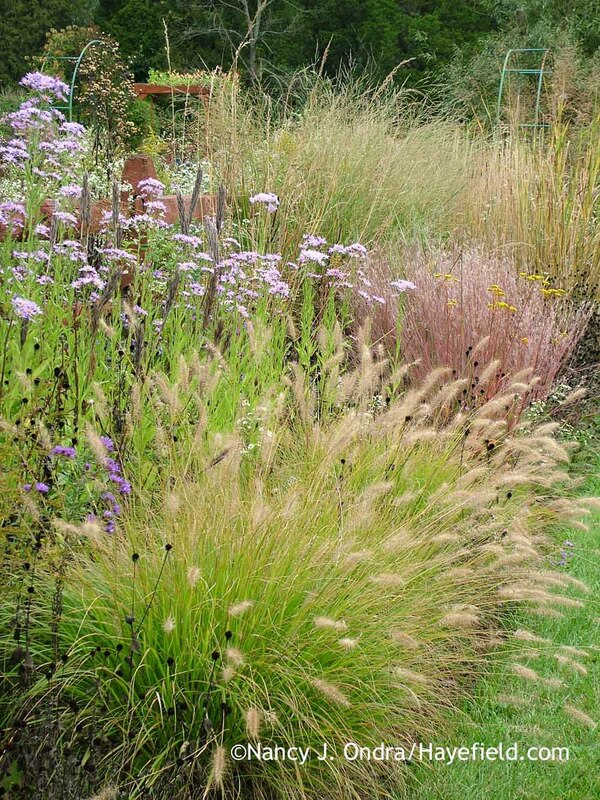 …and they can linger well into winter. That’s a lot of return from a relatively small shrub! Almost Eden and Lazy S’s Farm currently list C. dichotoma ‘Issai’; Forestfarm carries both ‘Issai’ and f. albifructus. 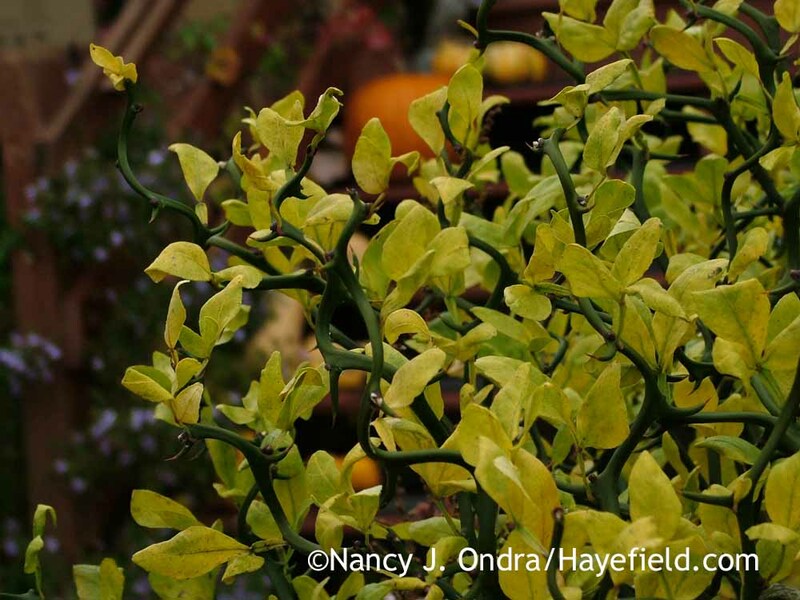 Another of my favorite multi-season shrubs is ‘Flying Dragon’ hardy orange (Poncirus trifoliata or Citrus trifoliata). 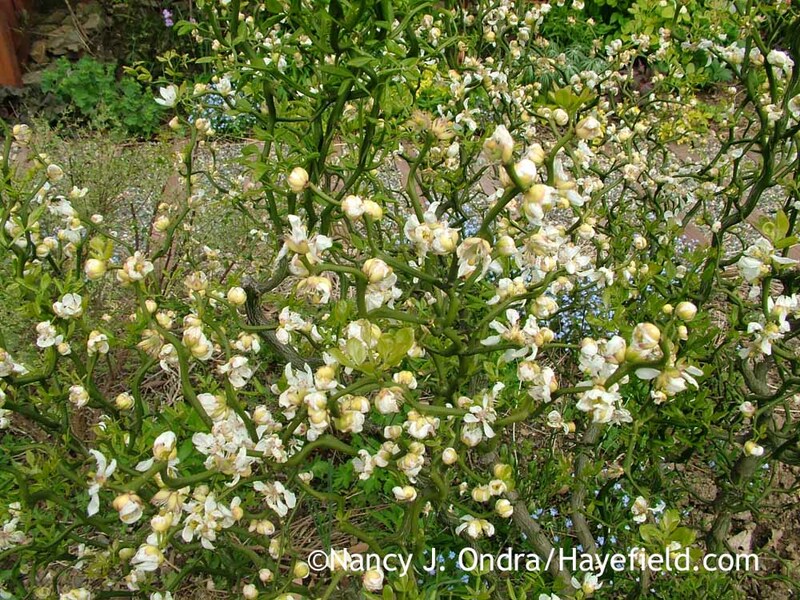 The curiously contorted and wickedly thorny stems carry an abundance of white flowers in late spring. 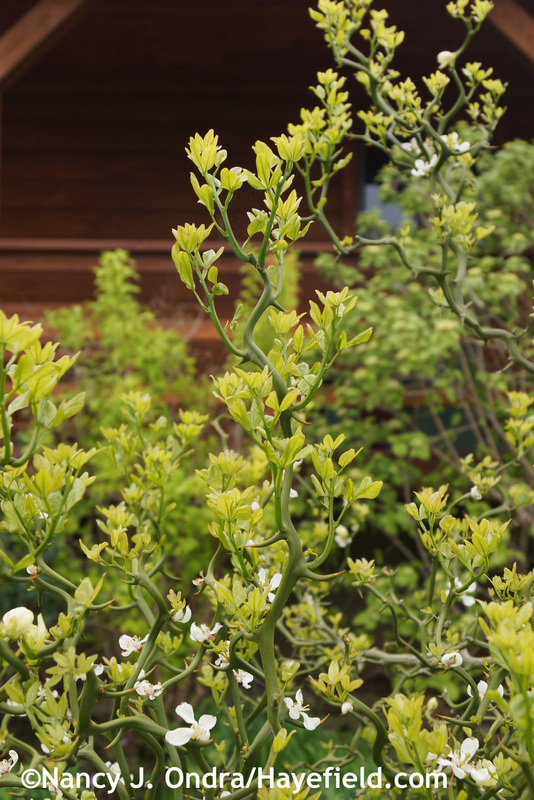 As the flowers finish, ‘Flying Dragon’ becomes a study in green, with glossy leaves, green stems, and rounded fruits. It begins to grab attention again in mid- to late September, when the fruits ripen through yellowish green to rich yellow. 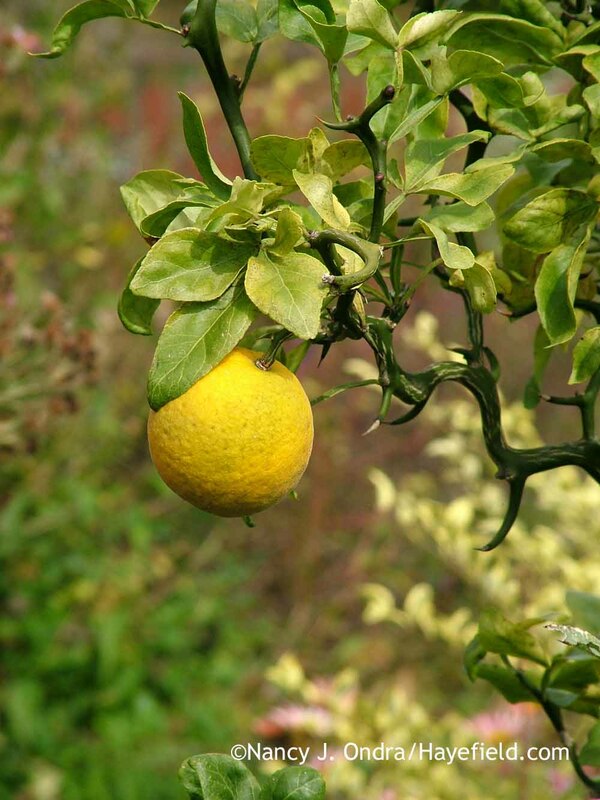 The fruits are edible but not tasty–they’re mostly seeds, anyway–so there’s no need to plan for access for harvesting. 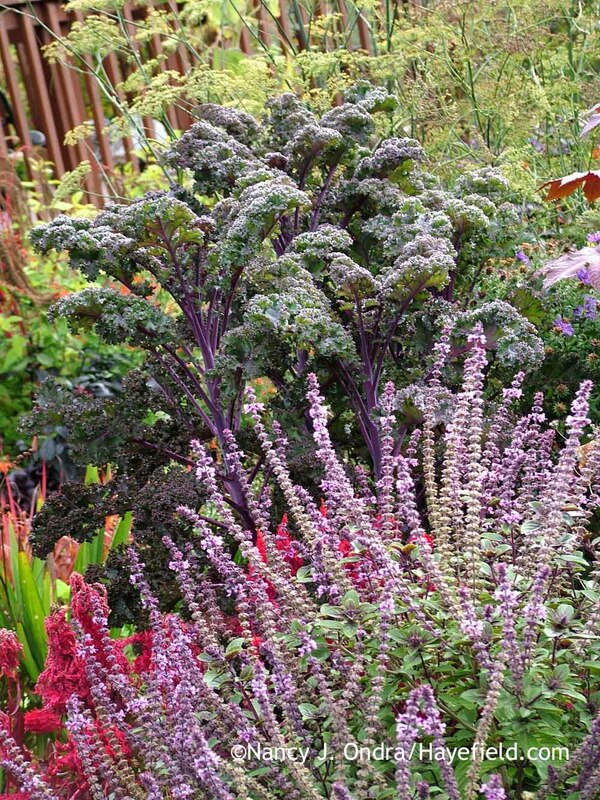 It’s best to keep ‘Flying Dragon’ toward the middle or back of a bed or border, where it can mingle with other late-season beauties without snagging passersby. As the season winds down, the leaves also develop yellow fall color. 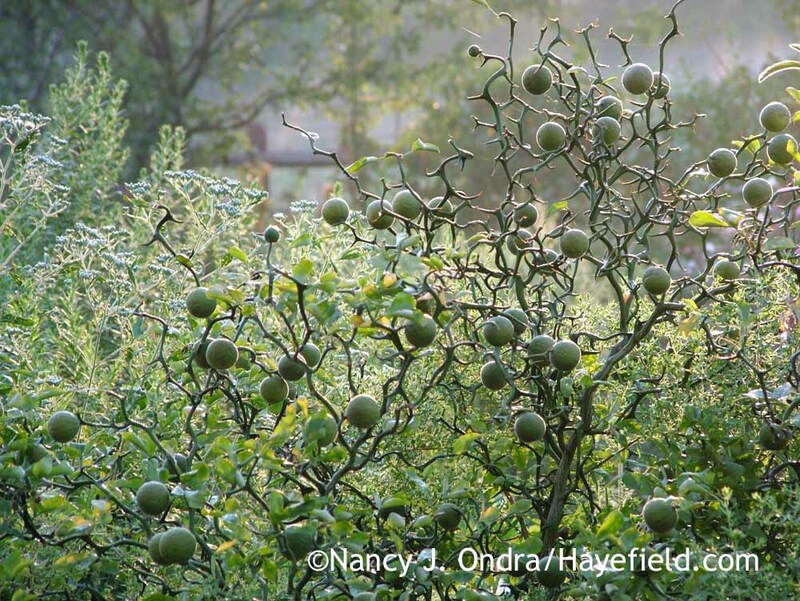 The fruits usually drop as fall draws to a close but sometimes the linger into early winter, providing extra interest to the green winter stems. 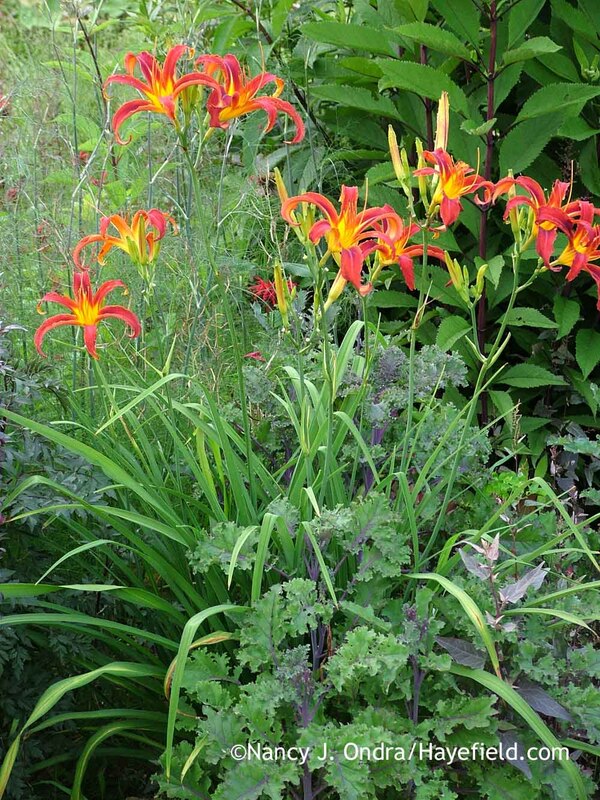 Two sources for ‘Flying Dragon’ hardy orange include RareFind Nursery and Quackin’ Grass Nursery. 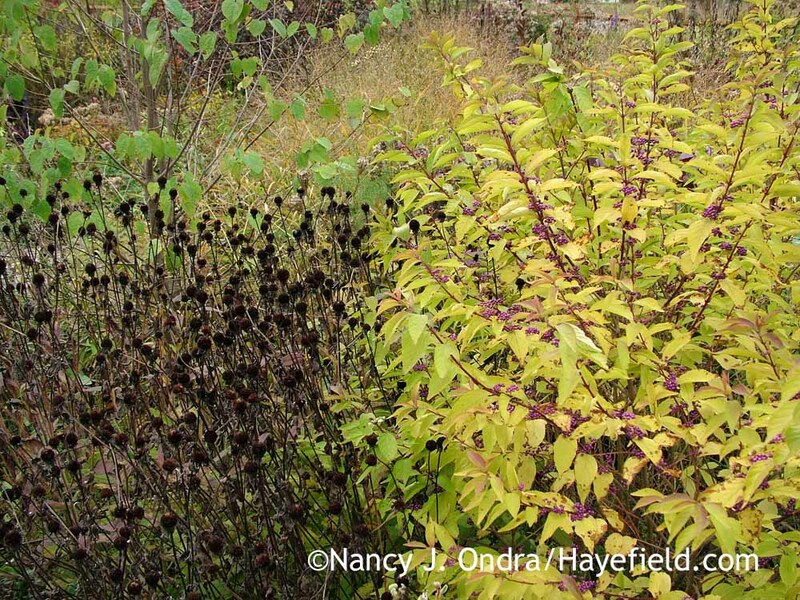 Be aware that the species is considered invasive in some areas, so check that out before you decide to add this plant to your landscape. 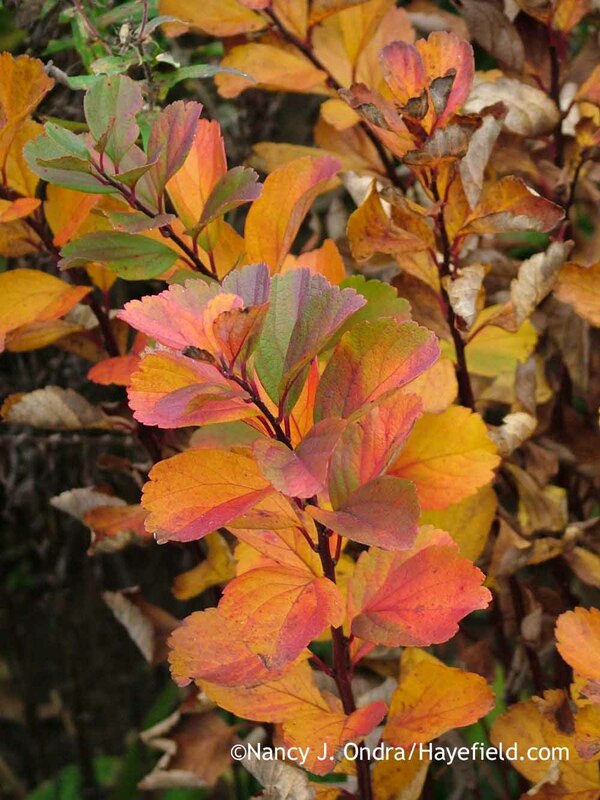 Shrubs and trees for autumn color changes? Sure, there a lots of them. 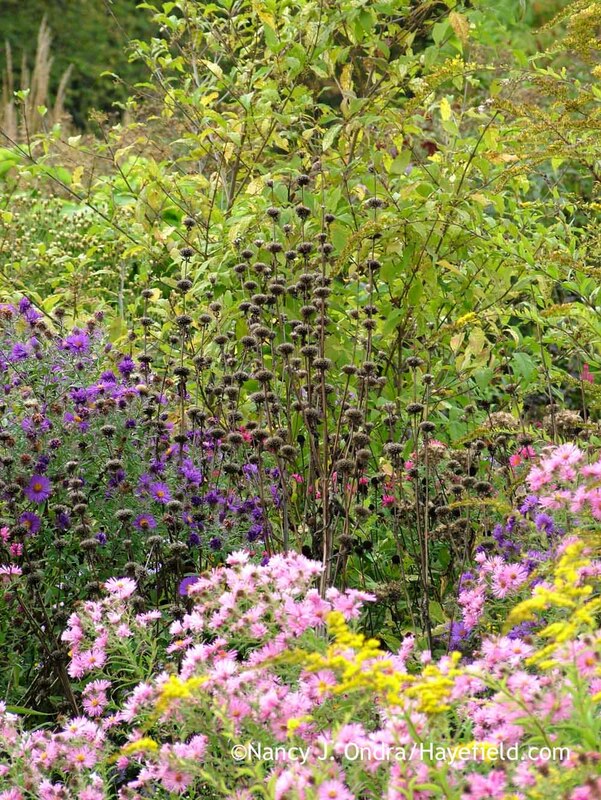 Herbaceous perennials? Yep, some terrific fall foliage there as well. 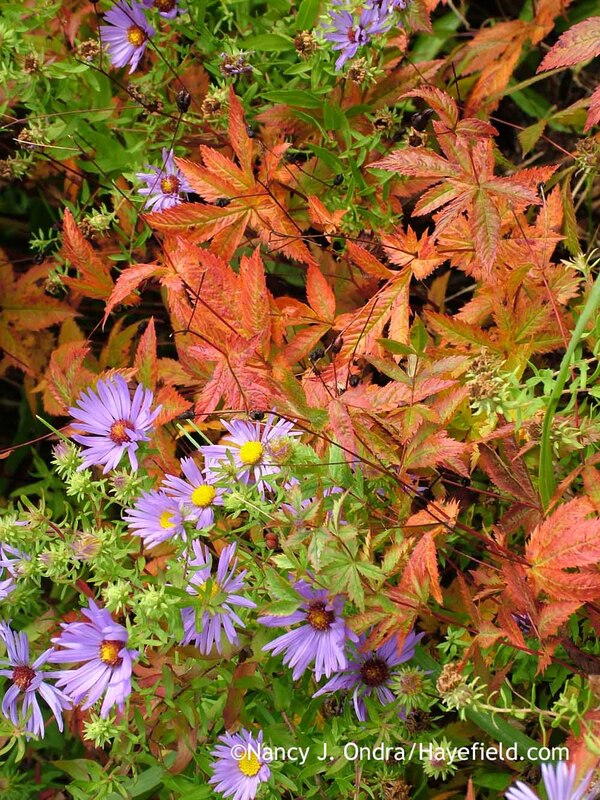 Annuals for lovely late-season leaves? Not too many. 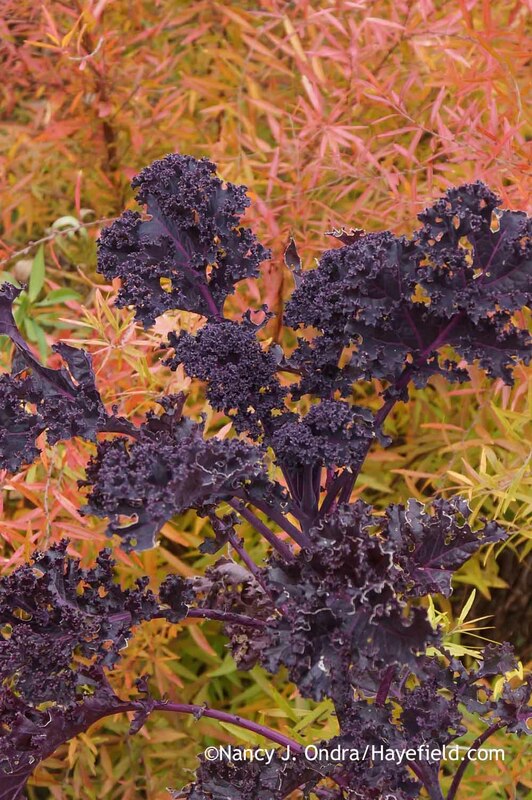 There are ornamental cabbages and kales, of course, usually sold in pots for use as fall fillers in borders and pots, but they often look like afterthoughts. 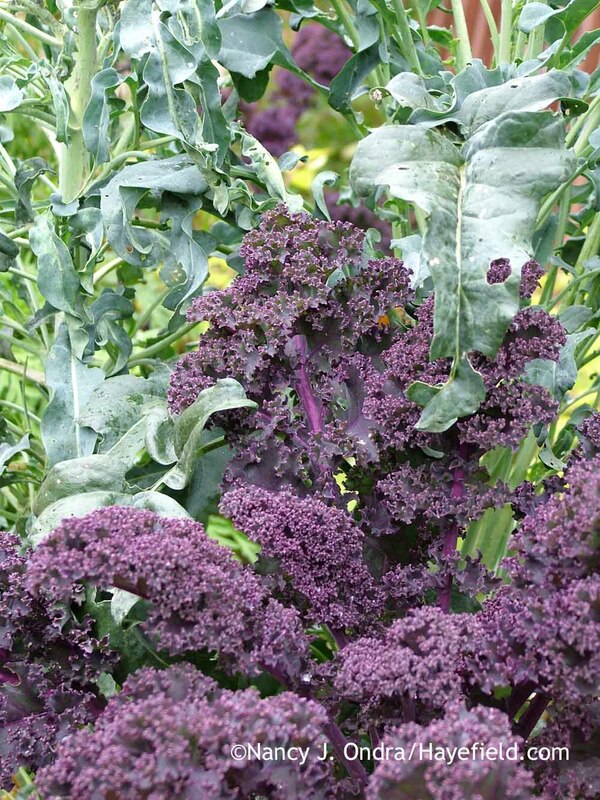 ‘Redbor’ kale (Brassica oleracea Acephala Group) is a variety normally sold as an edible, but it’s beautiful enough to earn a place in beds and mixed borders through the growing season. 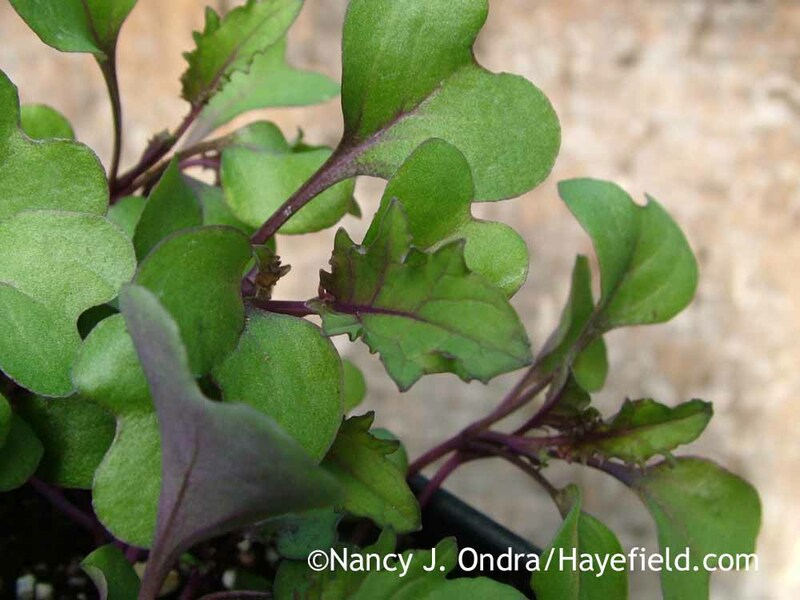 The young plants have purple stems, with green leaves that usually are tinged with purple (more green if the weather is hot, more purple if it’s on the cooler side). 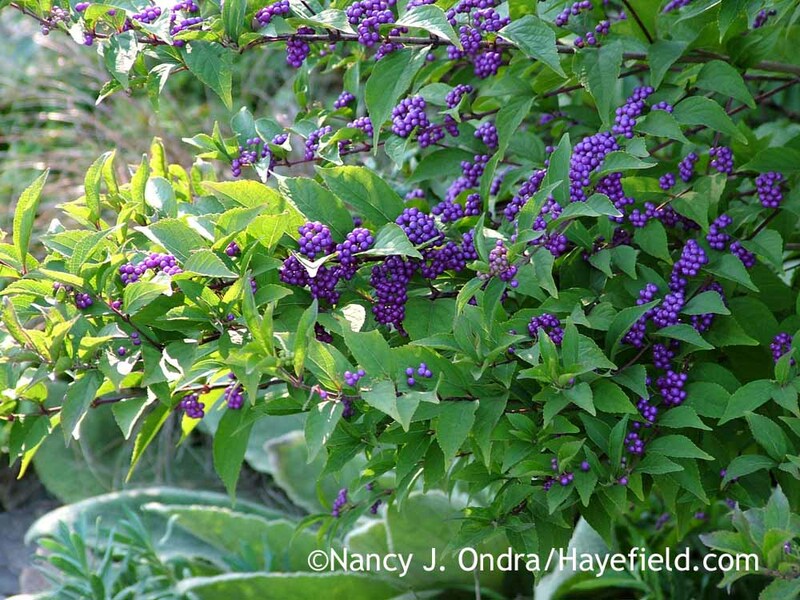 As the season progresses and temperatures are consistently cooler, the purple becomes more intense. 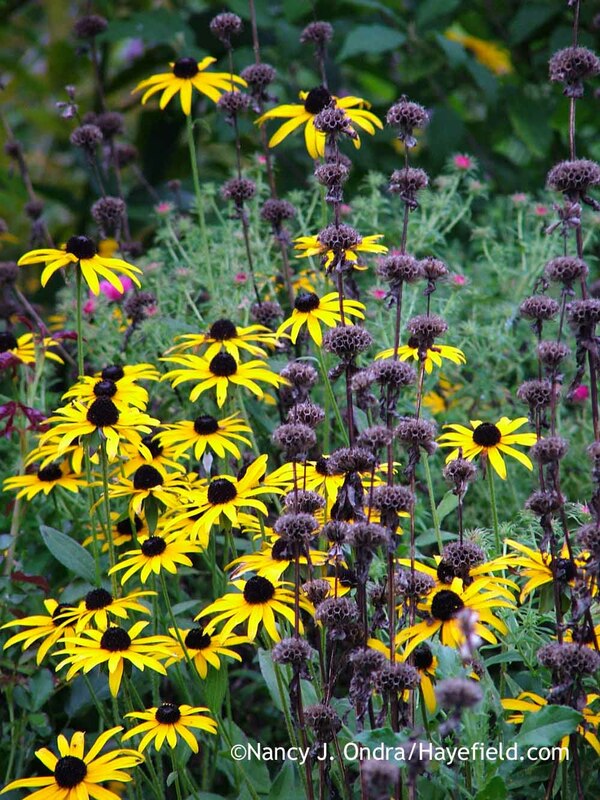 The strongly upright stems can easily reach 2 to 3 feet by the end of the season–even taller in rich soil. 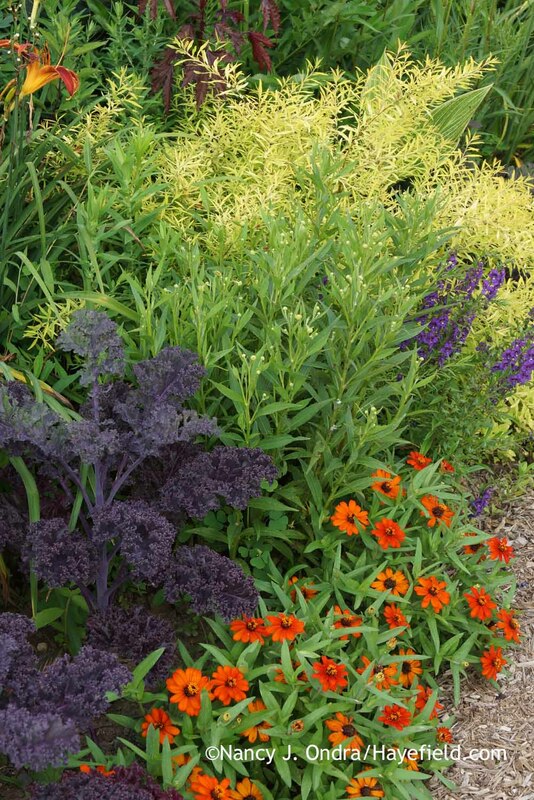 Even a single plant can be an interesting accent; a grouping can be quite striking. 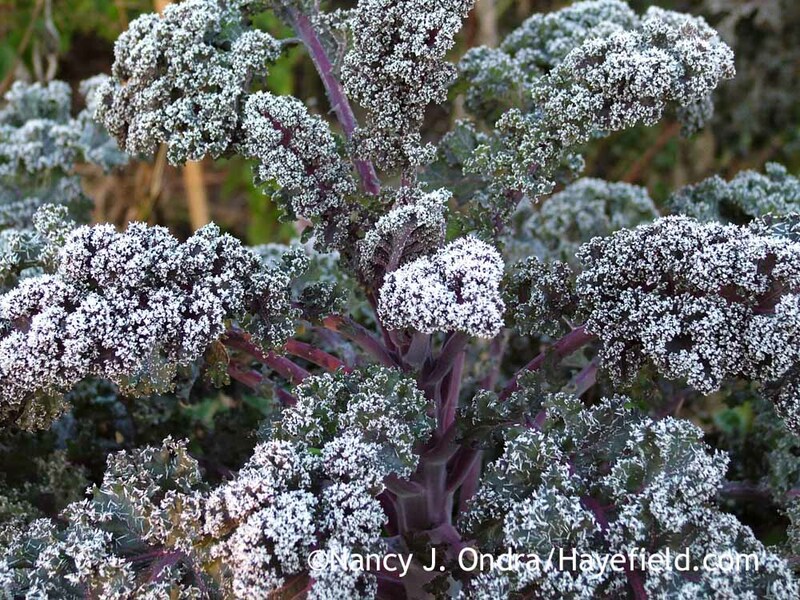 Like many other outstanding fall plants, ‘Redbor’ kale can also look good into winter. Technically a biennial, it occasionally overwinters for me and flowers the second year. Usually, though, either the wet causes it to rot, or the wild bunnies get it first. 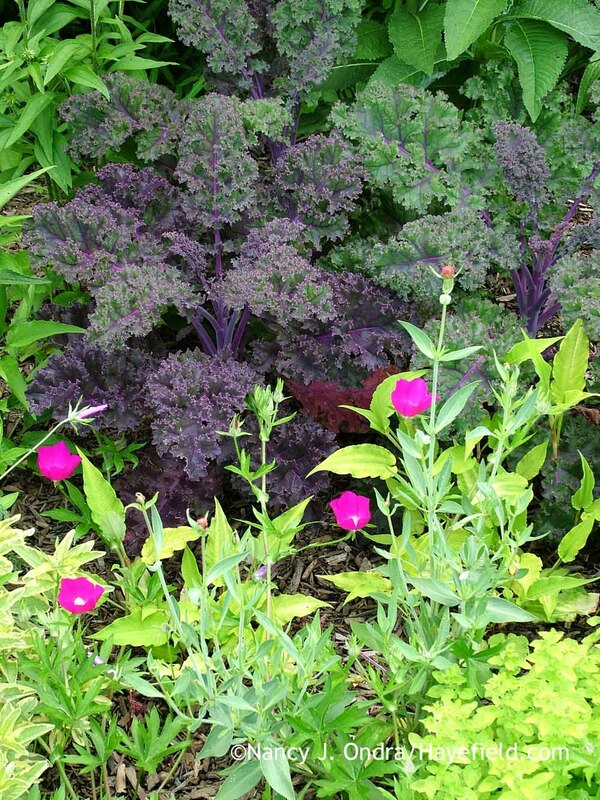 ‘Redbor’ is easy to grow from seed, which you can find at Park Seed or Territorial Seed Company, among other places. Or, you could buy it as a (really expensive) plant from White Flower Farm. 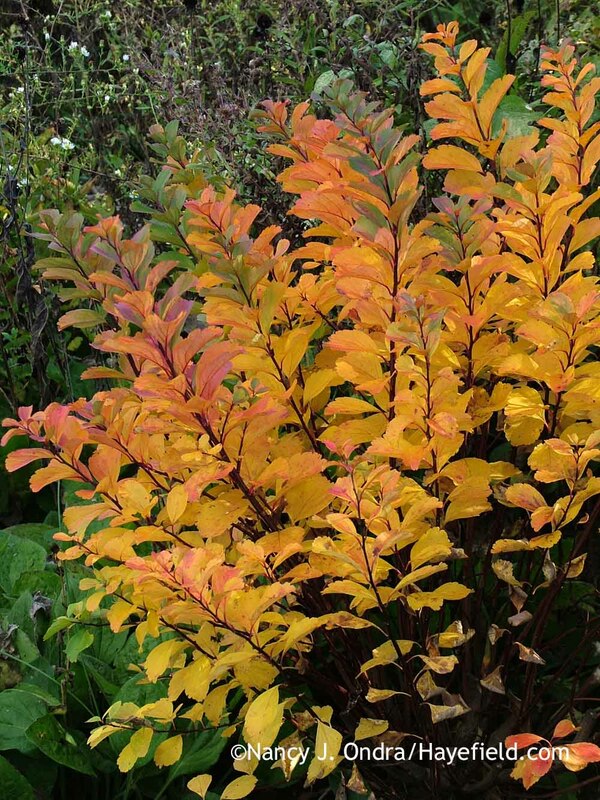 For perennial fall color–and earlier interest too–consider the Bowman’s roots (Porteranthus or Gillenia). Native mainly to the eastern half of the U.S., this under-appreciated genus probably won’t ever grace a catalog cover, as it’s not an in-your-face sort of beauty. It’s not simply a “filler” plant, though. 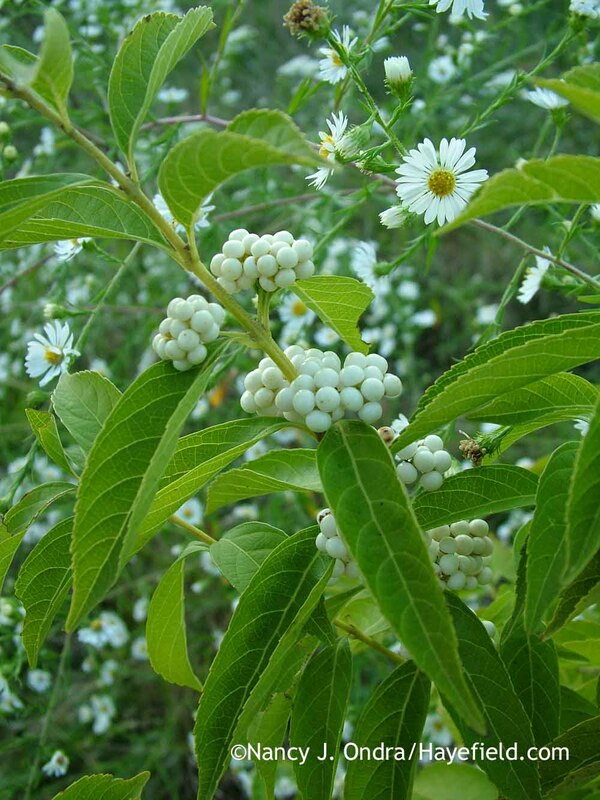 The dainty white flowers bloom in early summer: charming in some shade and even more abundant in sunnier sites. 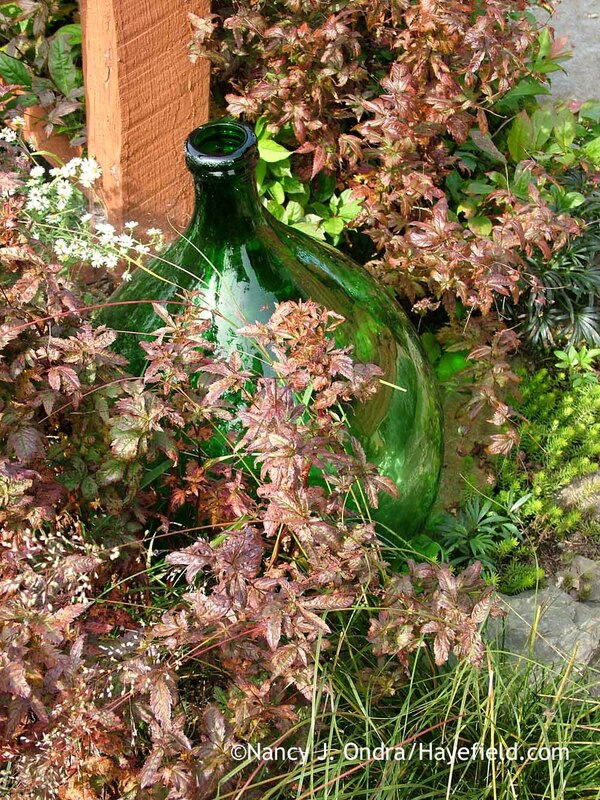 The effect is something like that of baby’s breath (Gypsophila paniculata)–nice for those of us with acid soil, where baby’s breath can be a bit sulky. 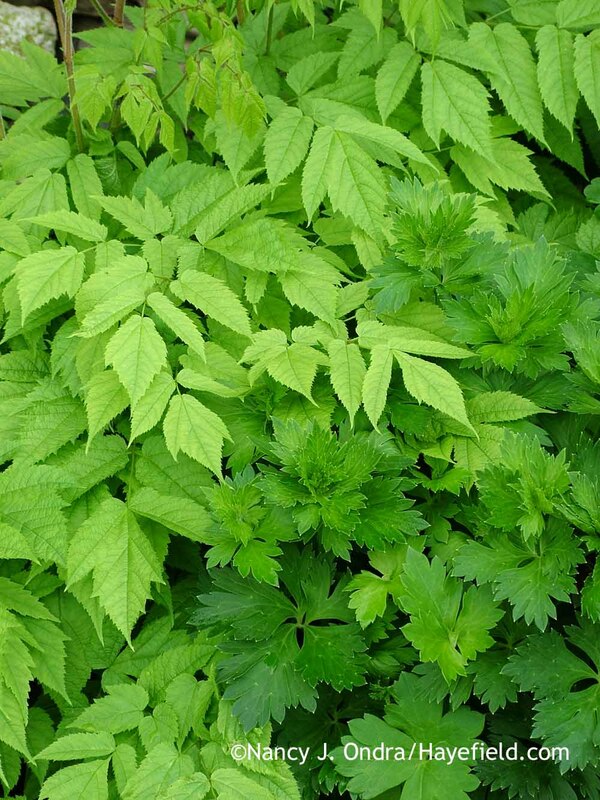 During the summer, it’s just green, but the leaves are pleasing for their fine texture. 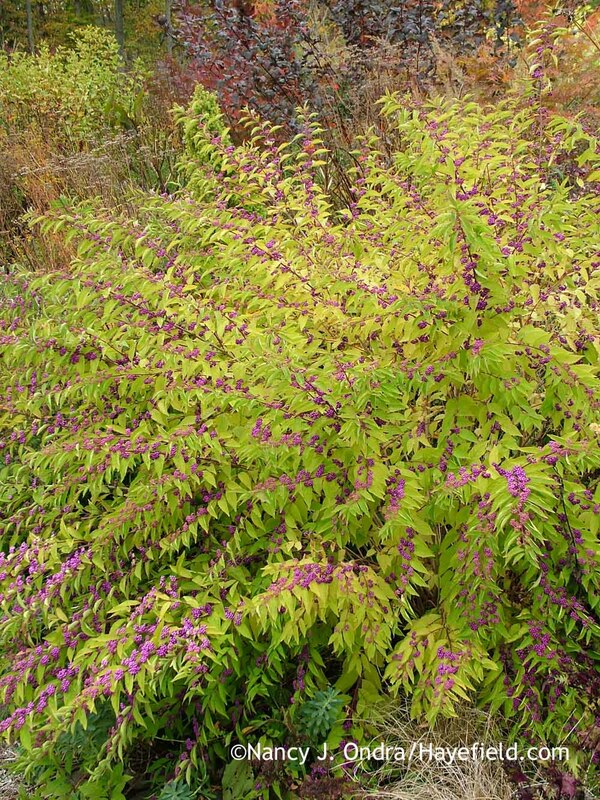 I particularly like the lacy look of American ipecac (Porteranthus stipulatus). 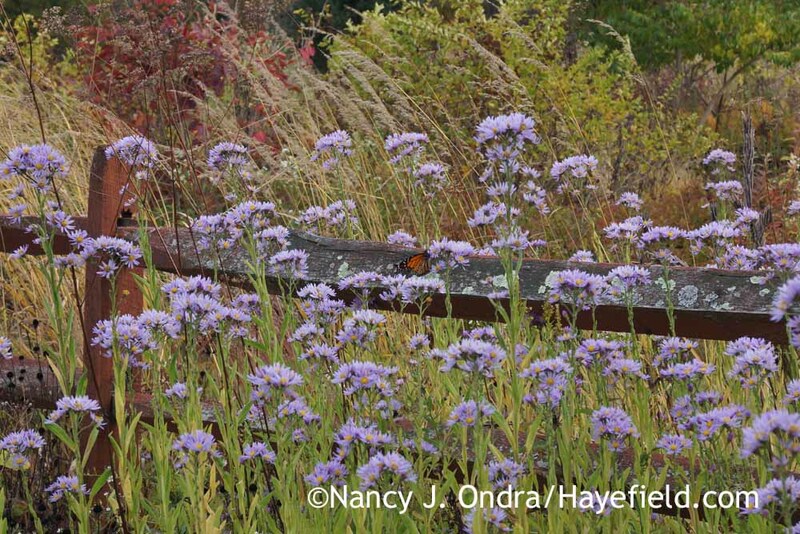 As fall approaches, the developing fall color of its leaves and small seedheads catches the eye again. 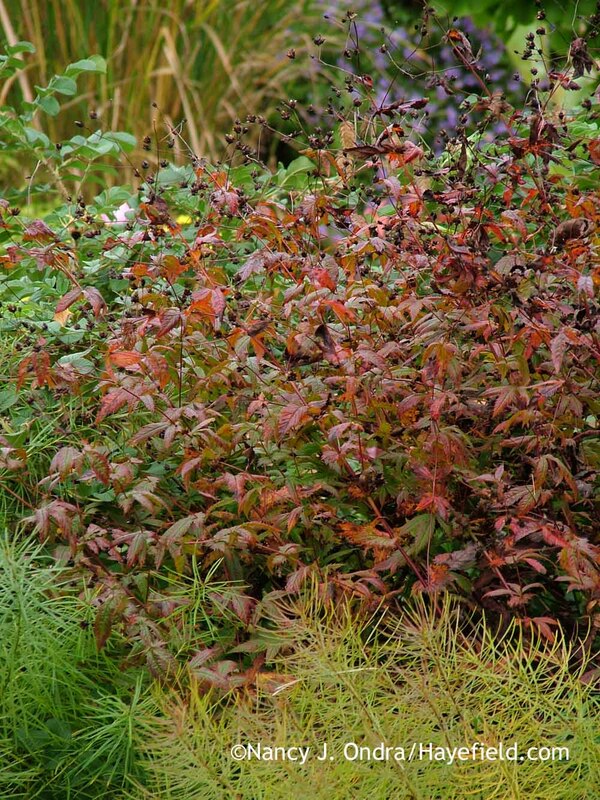 The foliage can range from maroon to rich shades of red and orange. 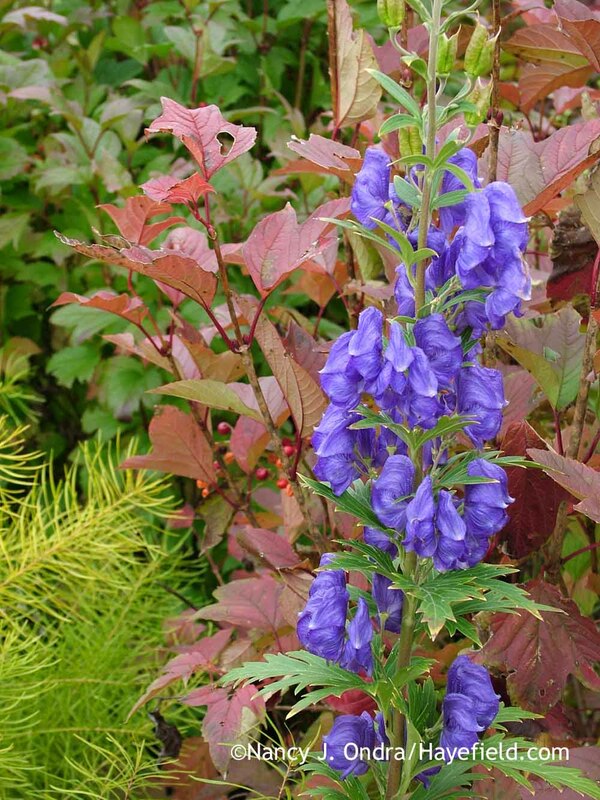 Two sources of American ipecac plants are Prairie Moon Nursery and Sunlight Gardens. 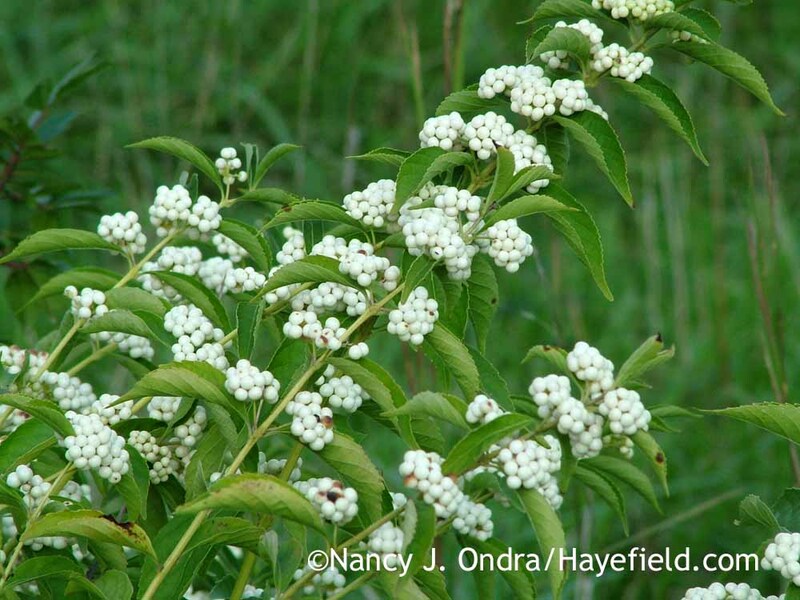 And last, a selection of another native: ‘Tor’ birchleaf spirea (Spiraea betulifolia). (Well, I say “native”…depending on which source you believe, the species is native to eastern Asia, or the Pacific Northwest, or various other areas in the U.S. and Canada.) 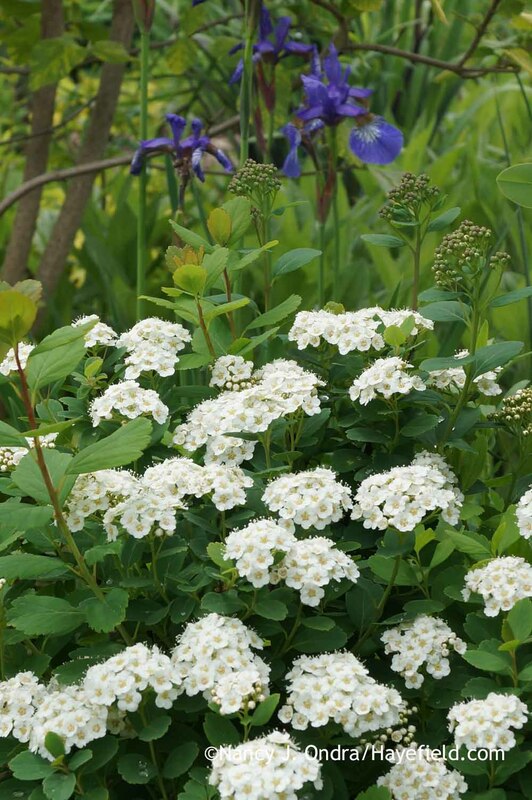 Whatever its origin, it’s cute in bloom, forming a dense mound practically smothered with clusters of white flowers. 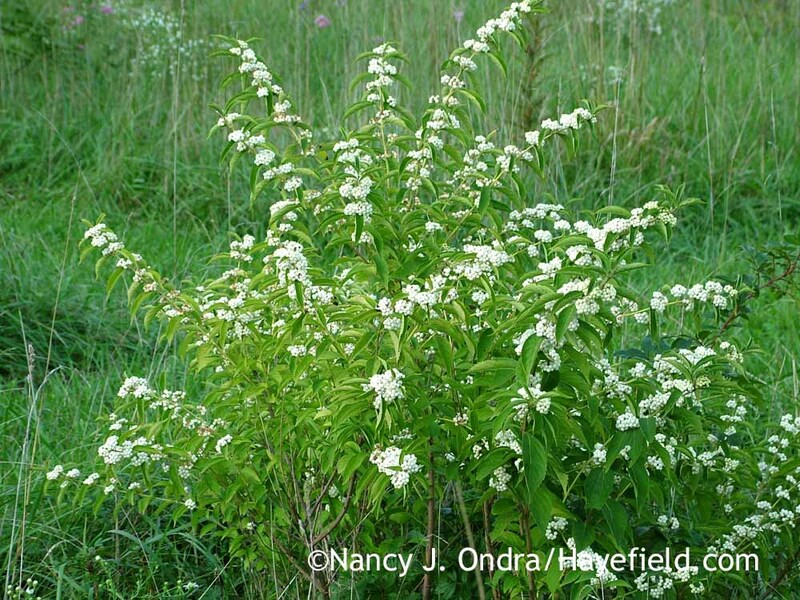 As with the Bowman’s roots, it’s easy to overlook ‘Tor’ birchleaf spirea in summer; it’s just a dense mound of foliage typically 2 to 3 feet tall and wide. 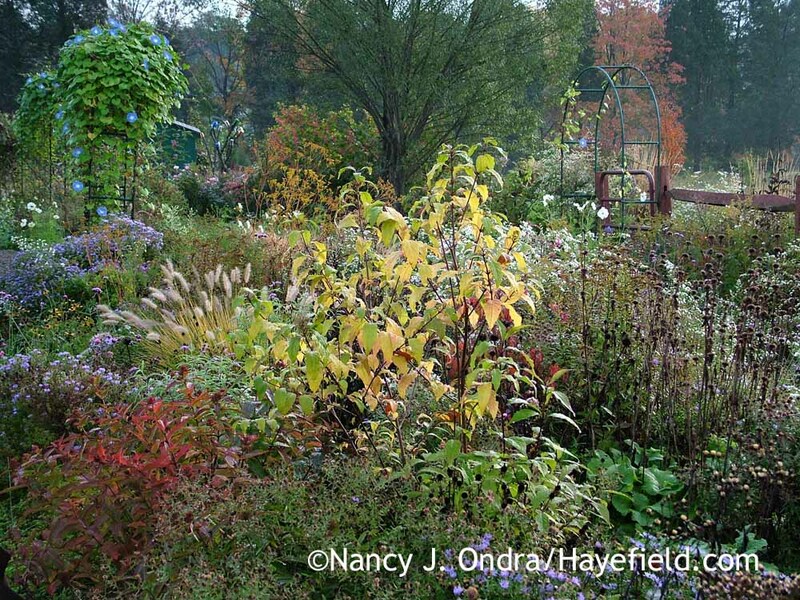 But oh, wait until autumn, when the grayish green leaves take on vibrant yellows, oranges, golds, reds, and purples. Each year, the colors are a bit different, but the effect is always spectacular. 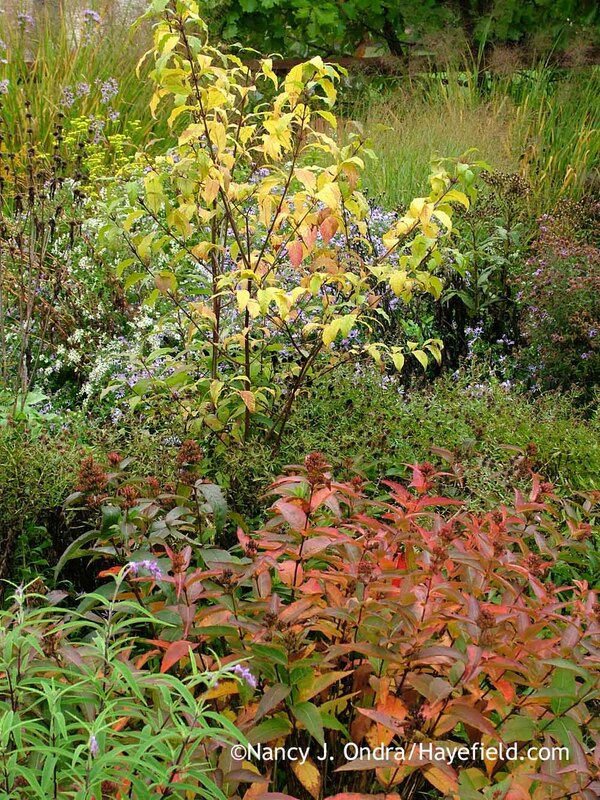 A couple of sources for this beautiful and adaptable deciduous shrub include Lazy S’s Farm and Quackin’ Grass Nursery. Well, that’s enough to be going on for this fall, I think! I hope you found a few things of interest on the list. One more thing: today (March 1, 2016) is the last day for the giveaway to win a copy of The Perennial Matchmaker at Goodreads. Good luck to all of you who have entered! 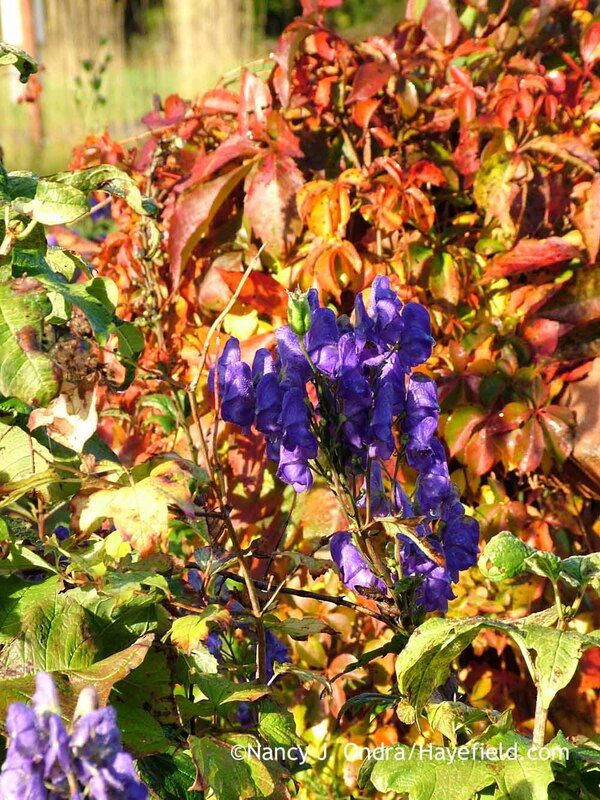 Wow, Sue–your monkshood even beat mine. You certainly deserve an early start to spring this year. It’s great to hear that you are sharing that nigella, too! Hey, Nancy! 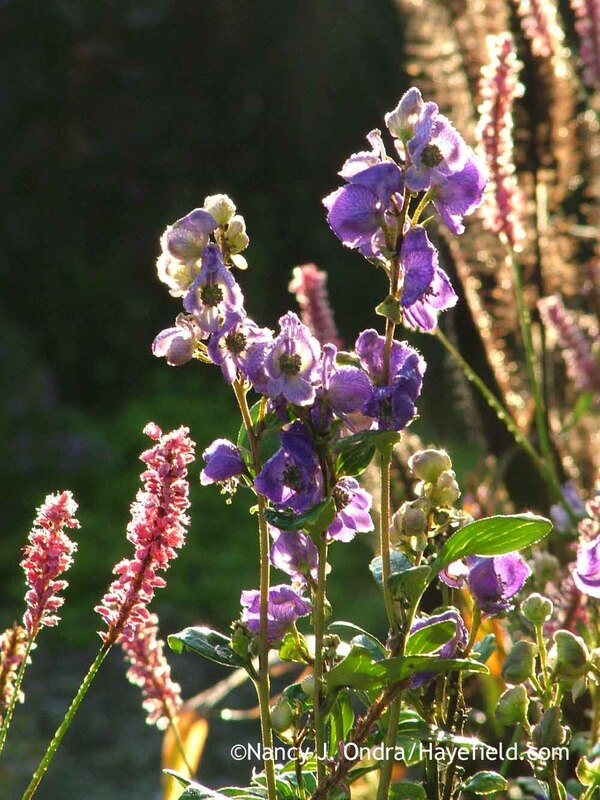 No, I don’t water the monkshood. It seeds around and comes up where it wants to. Some of the plants are in full sun, others get some shade part of the day from taller partners. Same with my shredded umbrella plants: several are in full sun, while a few get some shade from mid-afternoon on. 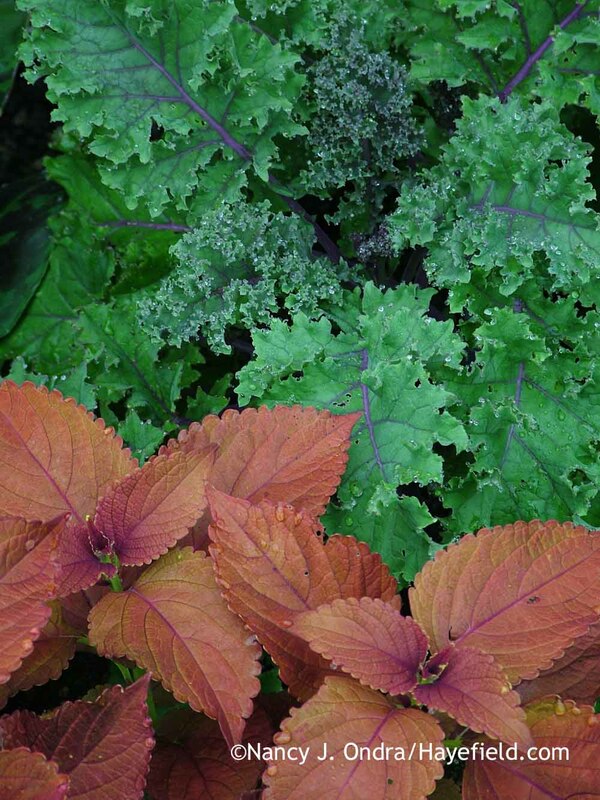 I usually do start the kale in a pot, either indoors or out in March or April, so I can move the seedlings to individual pots in April and then plant them out in May, once I know where I want them. Have fun with your new nursery bed; you did yourself a big favor, making a place for experiments! 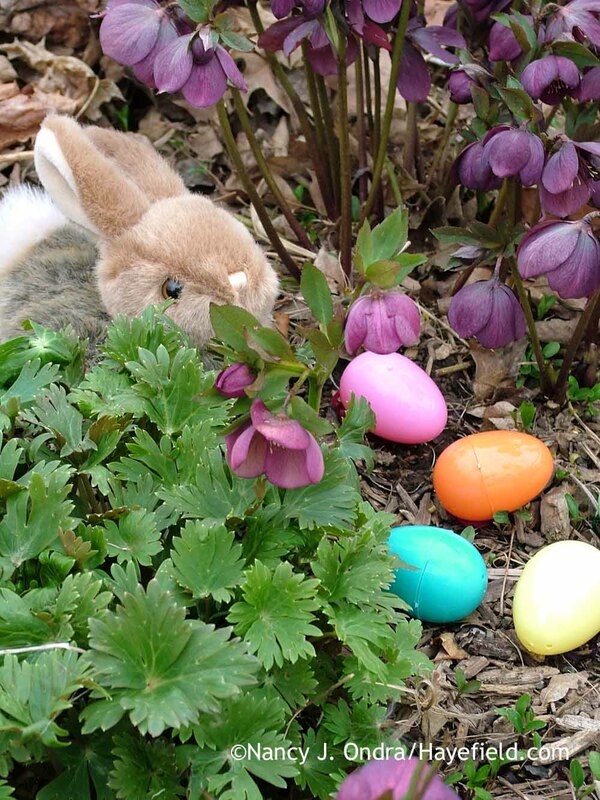 Now this is the type of bunny I want in my garden. Heh – yeah, I could tolerate a few more of those myself. You get the cute factor without the aggravation. Hi Barbara. Another good thing about ‘Redbor’ is that the purple leaf color makes it easy to spot green cabbageworms (I don’t know if they’re a problem where you are, but they sure are here). Hope you enjoy growing it as much as I have. While only a few of these plants are probably suitable to my climate, Nan, you’ve provided an important reminder to plan ahead. Even after the hot, dry summers in Southern California, it’s possible to plan for fall interest. Sorry about that, Kris; I know the favorites that do well in my Pennsylvania conditions don’t translate well to your climate. You do well with your own beauties, though! Without doubt, yours are some of the most seductive images out there! I want to try EVERYTHING–or die trying. But in the meantime, I will delight in my hellebores and snowdrops–TONS of snowdrops. :-) Thanks so much for the morning lift! Thanks for stopping by today, Nora. It was a treat to catch up with you at the Linden Hill chat room too! I LOVE how you inspire us all to walk on the wild side in our own gardens Nan and “see” them differently. 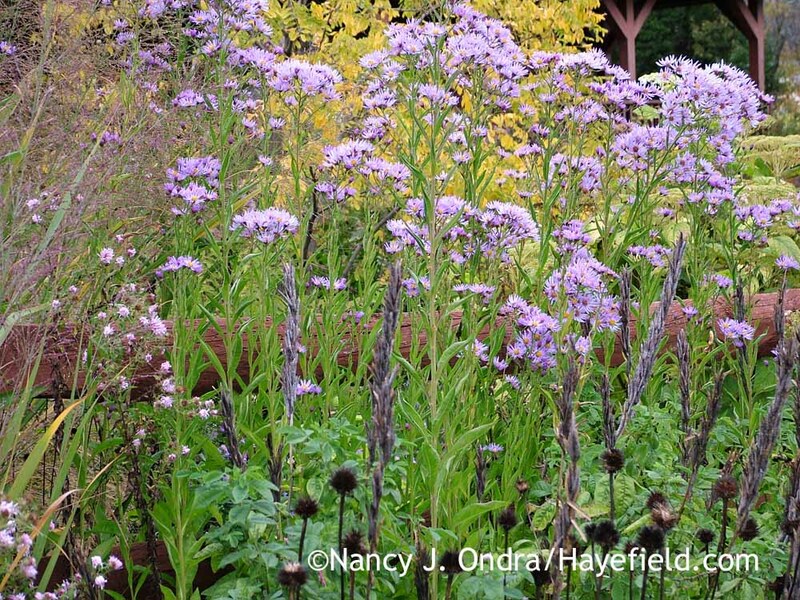 I have many of the plants you mention, but your descriptions make me look forward to seeing them again in fall with a different perspective. 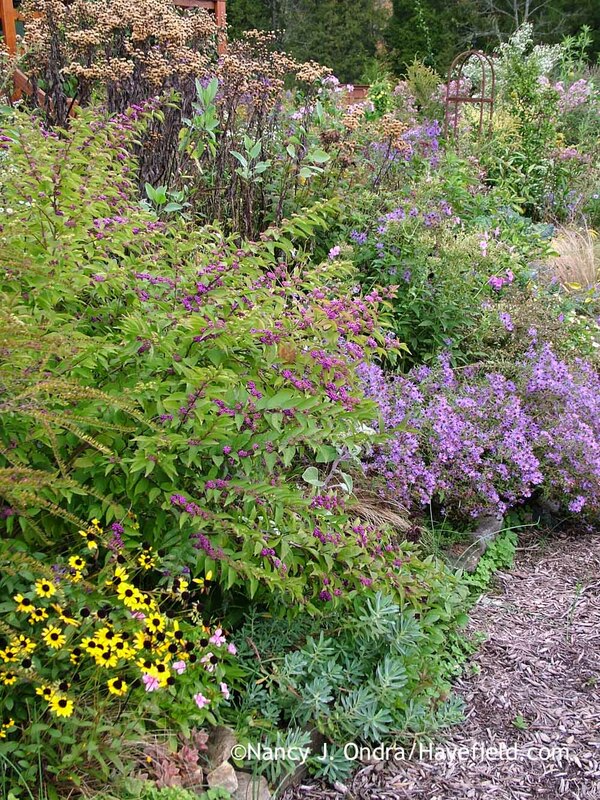 Maybe doing some rearranging… The dwindling Autumn garden here in Michigan is one way I cope with the long winter ahead of writing and lecturing about gardening, but not able to do it. Along with the ‘Sheffield’ Mum, I am crazy for the Global Warming Chrysanthemum series in this cast of garden characters as they are beefy, big and oh, so floriferous with giant flowers that are fragrant that add punch to the airiness of the other plants around them. 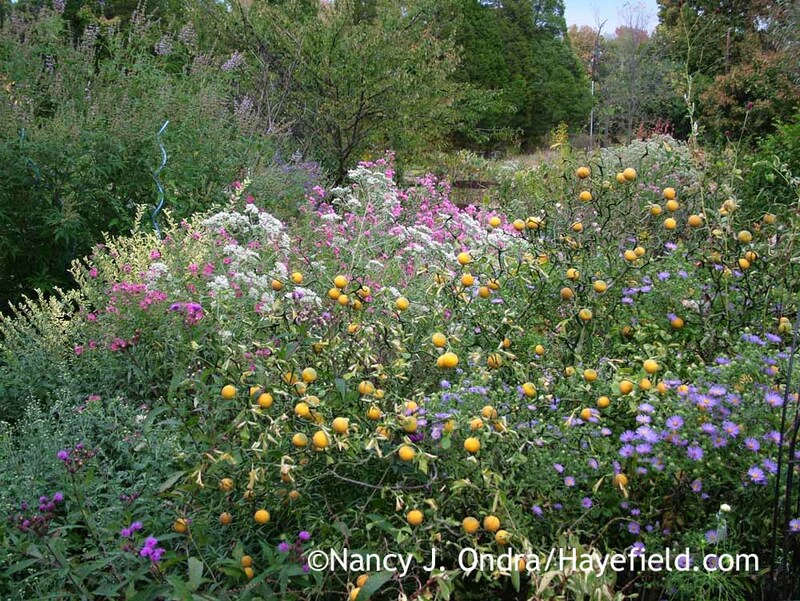 Like pictured in your blog, the last plants blooming that have a city full of bees and butterflies hugging them for dear life. 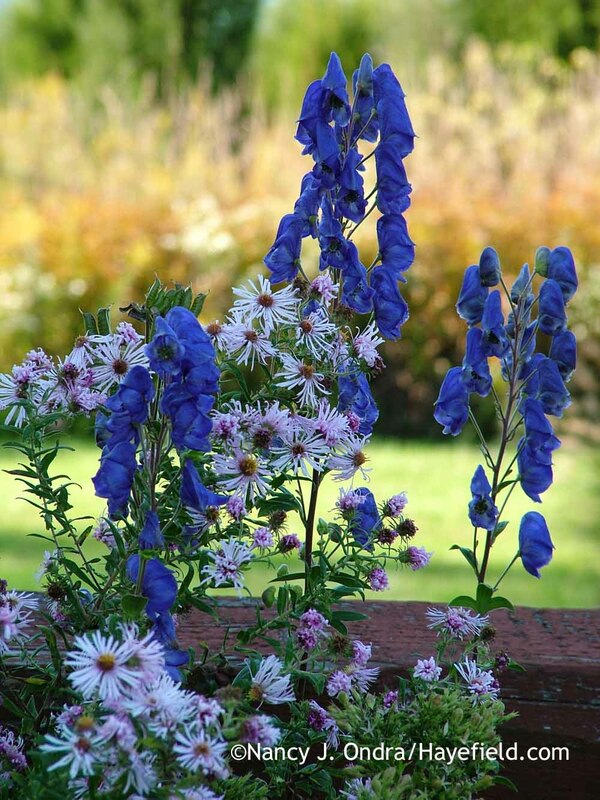 I’m looking forward to sowing seed you so generously sent this spring in our garden~Thank you! Ah, the endless opportunities for splendid combinations. That’s really interesting about those mums; I’ll have to look into them. Sinclair Adam Jr. has developed many terrific plants, so I have no doubt these are equally worthy. 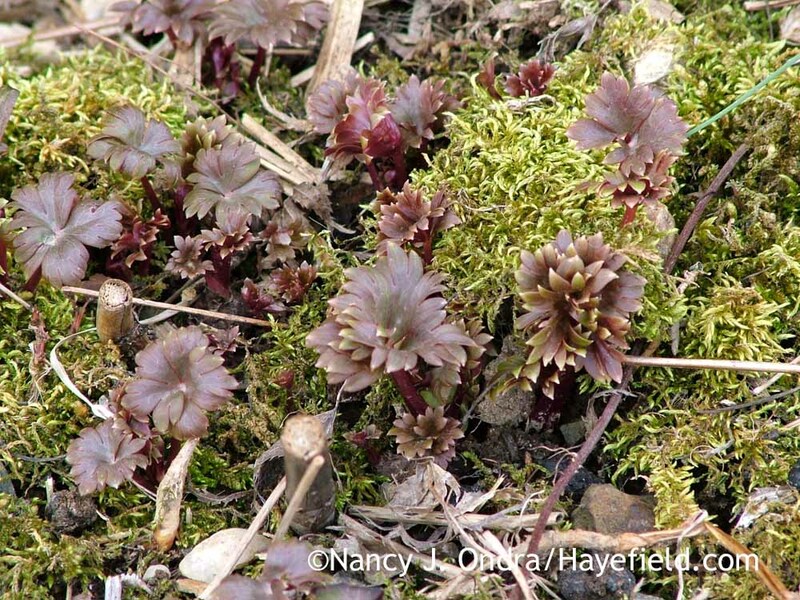 May you enjoy an abundance of seedlings this spring, Julia! Nan, what an inspiring post! Too many beautiful images for me to decide which I want as my desktop backdrop. 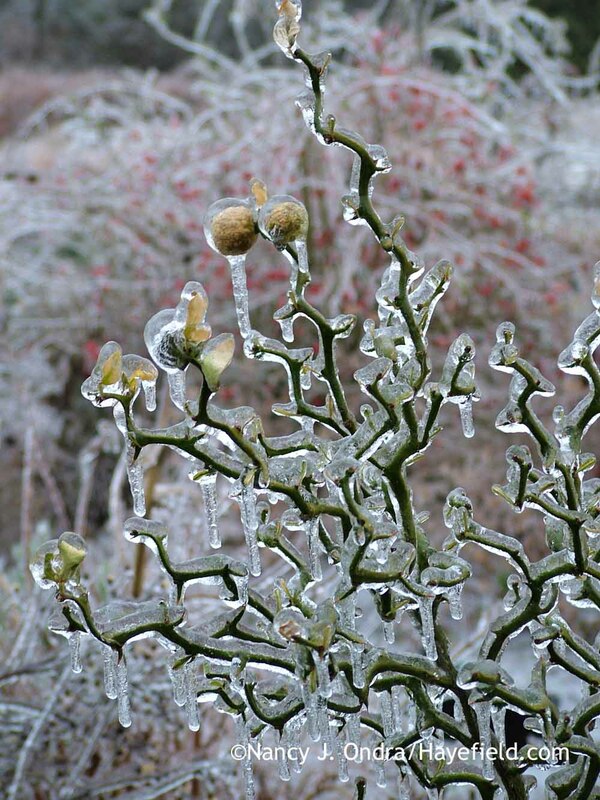 The images of the ice-encapsulated fruits are particularly captivating! Thank you for so many inspiring combinations! Sorry to provide too many choices, Sarah (but not *very* sorry)! 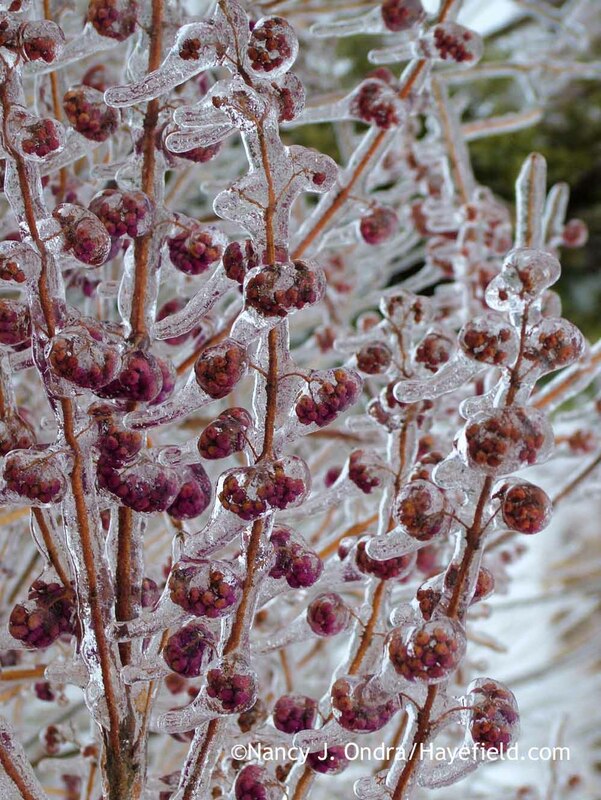 Freezing rain is no fun if you have to go somewhere, but it certainly does make for fantastic photo opportunities. Thanks so much for this great post, Nan. 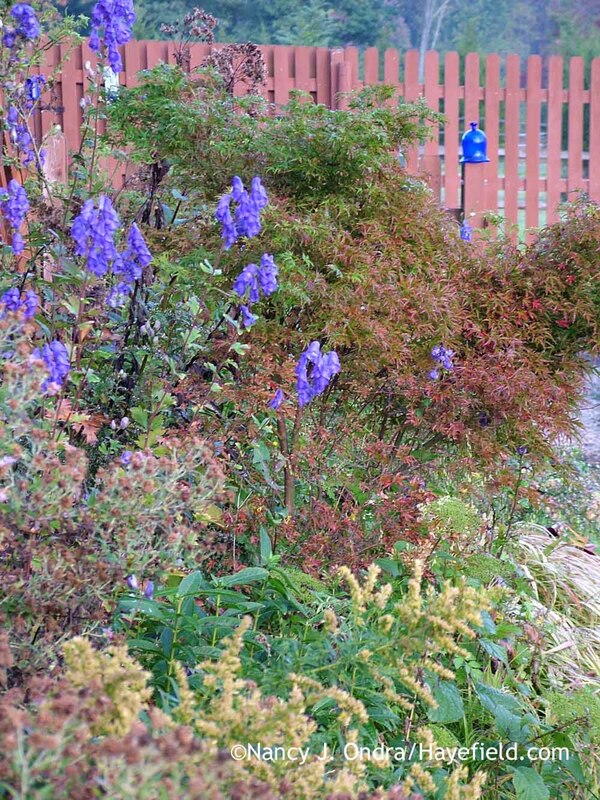 I was just in the process of working on a garden design and stuck for some clever ideas for fall bloomers. You came to my rescue. 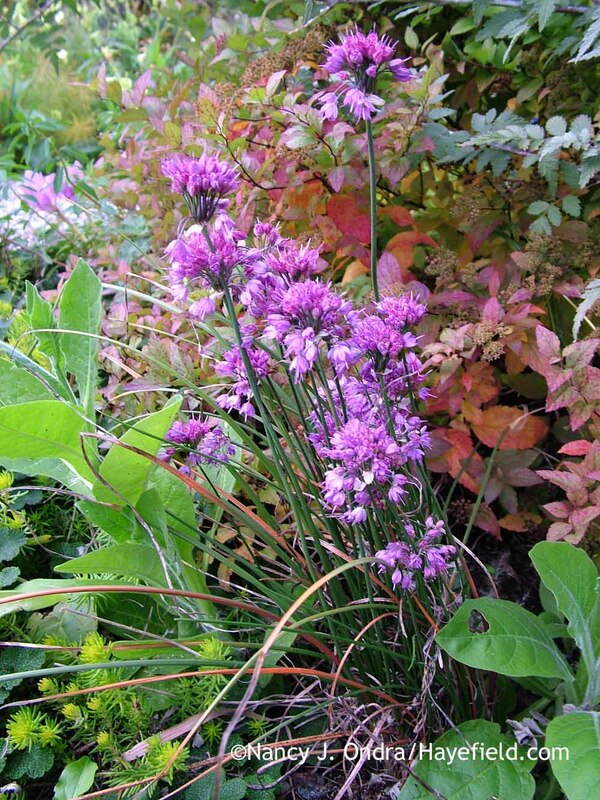 I love the look of the Allium thunbergii and the fact that it blooms so late in the season. Perfect to stick into my design. And the kale is a great idea as well. Much appreciated. You just made my day, Marge; it’s super to hear that! I think you’ll really enjoy both plants. 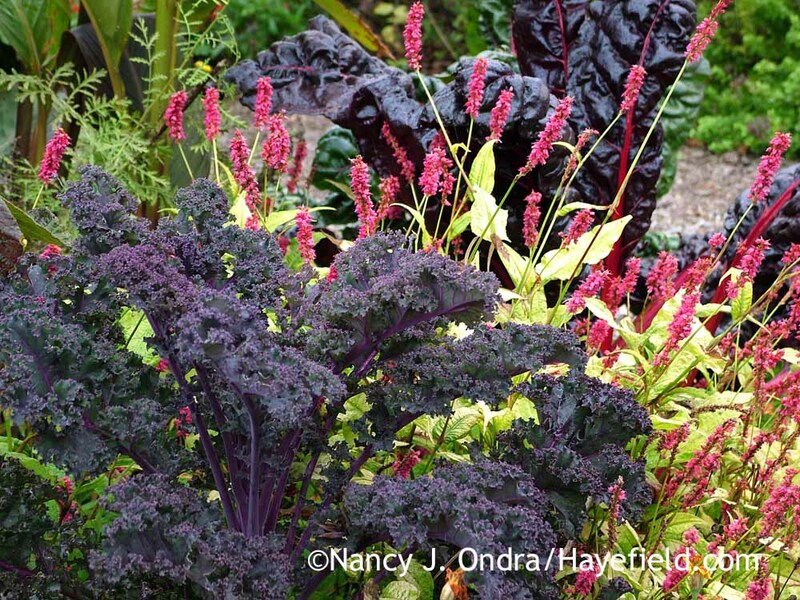 More great plants to consider adding to my garden!! 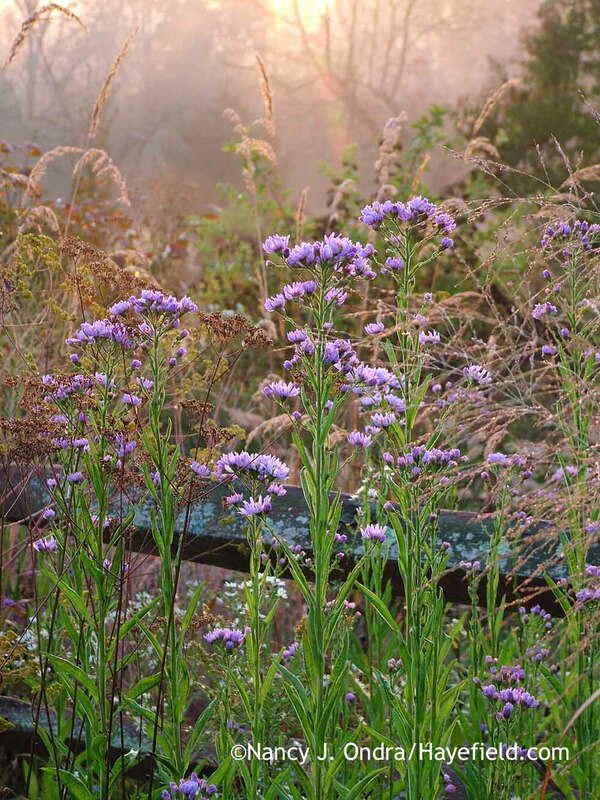 I was inspired by you last year and planted some ironweed and burnet in the fall. I am worried that they may not have survived the winter. I gently moved some of the dirt aside from the root ball and can see no sign of life in them. I assumed they would work well in my Central Virginia garden since it’s the same zone as yours. I won’t give up hope just yet and will reorder if they died. Maybe a spring planting will suit them better. 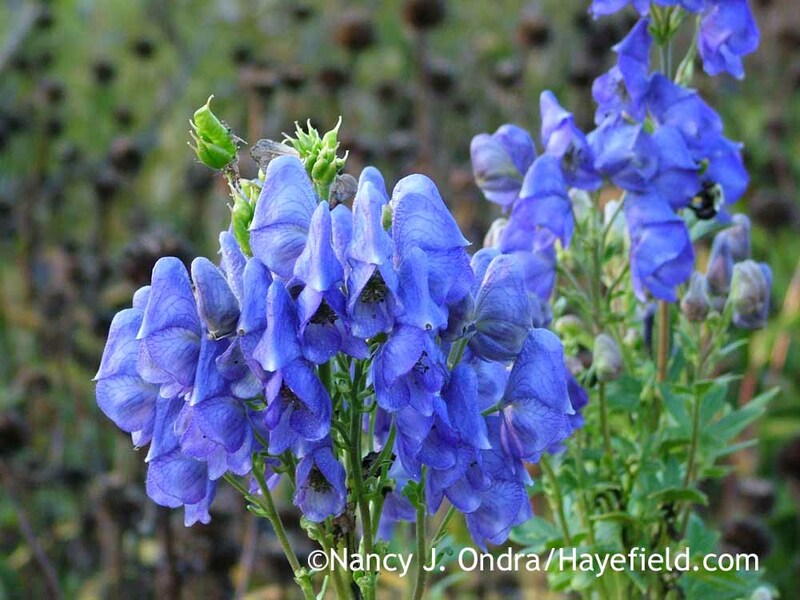 Thanks for sharing your experience and inspiring photos, Nan! Hi Debbie! 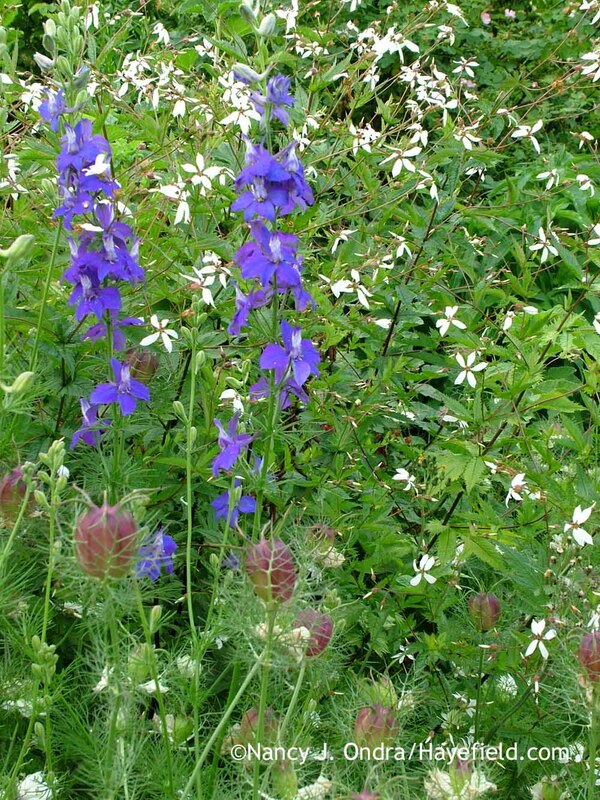 Generally, yeah, I think spring planting suits late bloomers better–especially burnets, which seem to do best here when moved before they start new growth, in late winter to early spring. You’re right to hold onto hope, though. 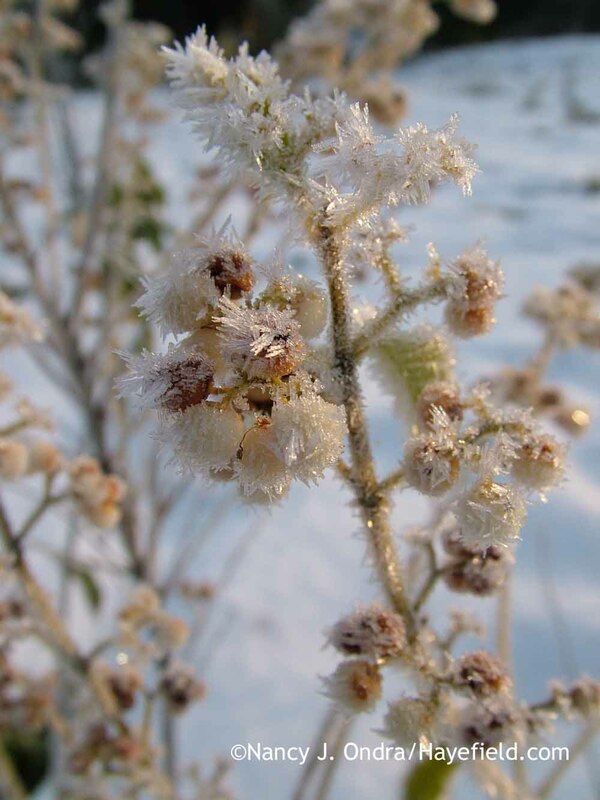 I’ve noticed that ironweed crowns can be very deep (several inches below the surface) and slow to sprout. The depth makes digging them out a challenge, but it’s good for supporting those tall sturdy stems, I guess! Oh noooo…no more ice for us this year! It’s kind of you to say that you enjoy the multiple images of each plant. I too think it’s fascinating how a single clump can look so different. It’s very difficult choosing just a few images of each. I can’t tell you how much I enjoy your posts. I especially appreciate seeing first growth to end of the season transformation. I love the close up pics and the ones from farther back to see more of the grouping. I feel like I rack my brain trying to include fall color but don’t know where to put it, not knowing how it will perform through the other seasons.I feel like the Autumn colors will be my personal reward for all my Spring and Summer hours spent in the dirt. By the time late August arrives, my attentions are turned to other things and my season is over (other than planting spring bulbs and end of season cleanup). Fall happens by itself and tells me to sit back, relax and enjoy the show. I just need to know where to place the cast members! What I wouldn’t give to have your brain on my little patch of land for just a few days…. (sigh)…if only. 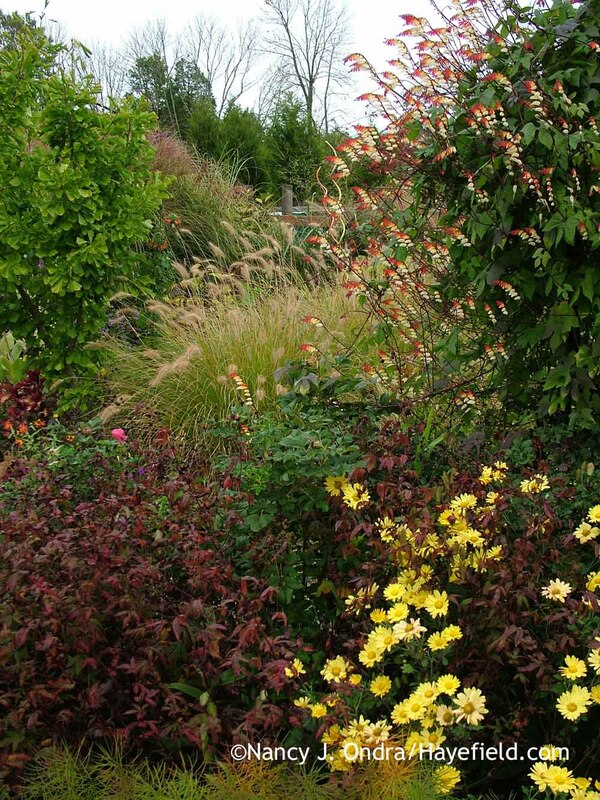 I am starting a design for an Illinois HOT GARDEN in hopes of a summer and fall display (the Spring show will be left to other areas), and I hope to add some of your suggestions into the mix. I do have a question. How do you catalog your photos? 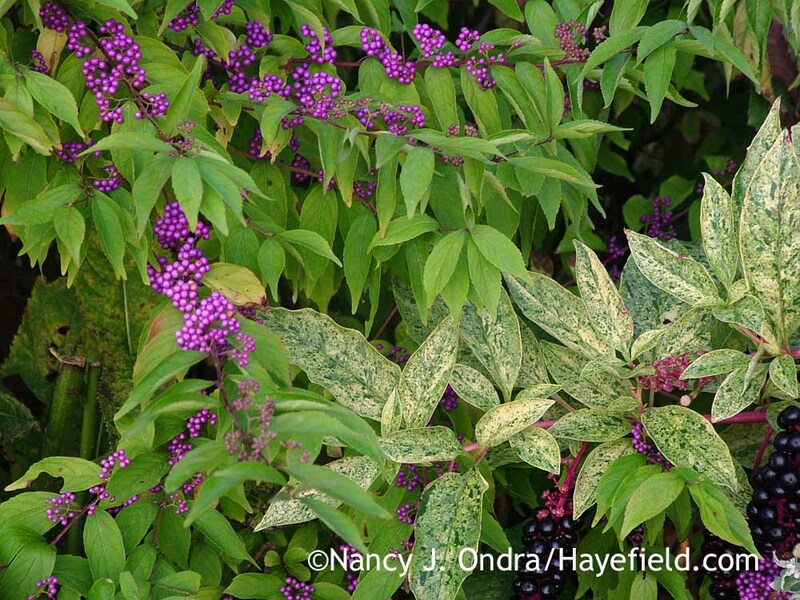 Are they tagged by plant name, season, year or/and area? Or do you put in folders?? Thank you for all your tips and for sharing so much of your beautiful space. Your thoughtful comments mean so much, Shelley. 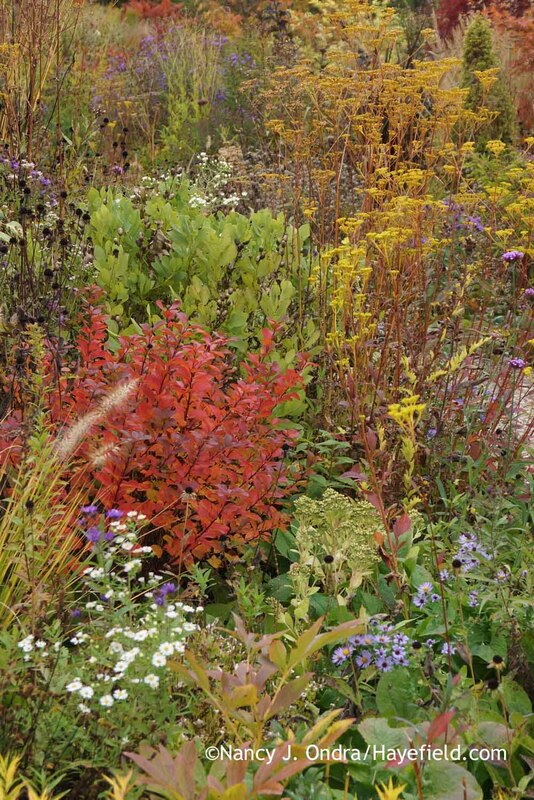 I agree that much of the joy of a fall display is that it can “just happen”–as long as you have a few special plants in place. 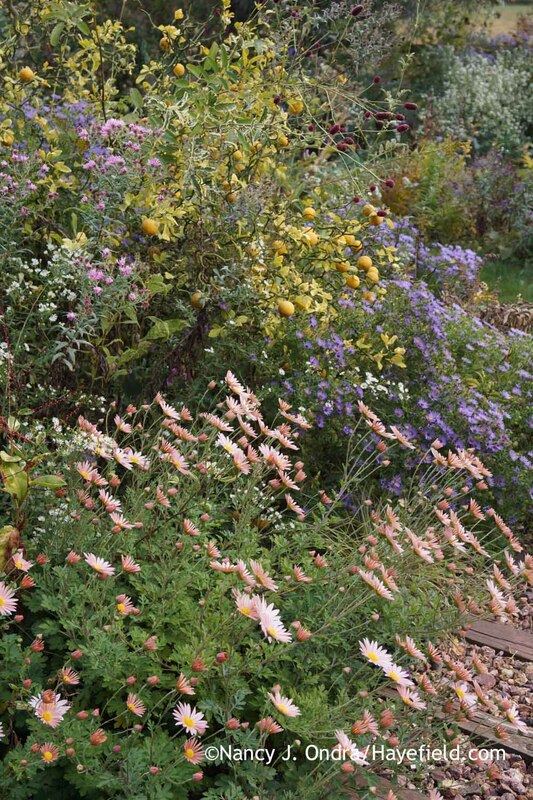 I do love asters, and mums are nice too, but I really appreciate the perennials and shrubs that look good in other seasons too, so you’re not giving up a lot of garden space for just one season. 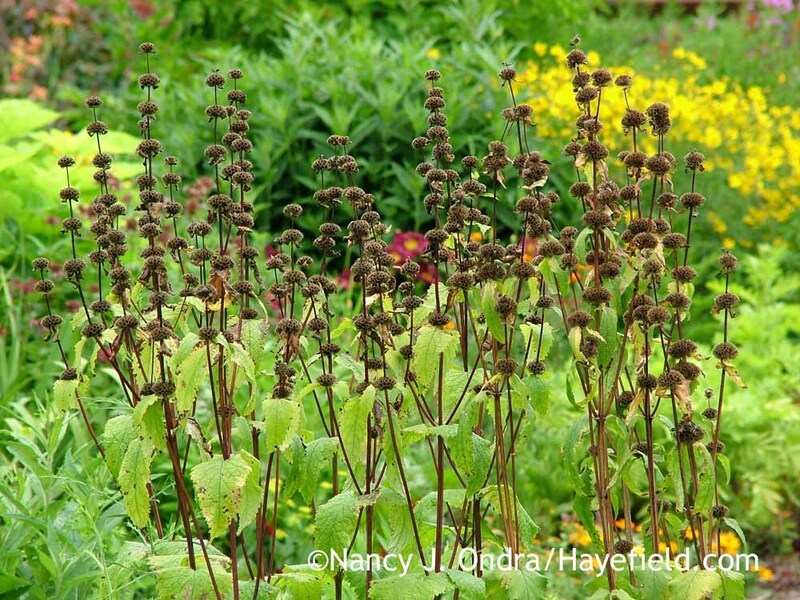 Holding off on deadheading in summer is also key: some grooming, of course, but putting up with a bit of meh” during the flowers-to-seedheads transition can really pay off later in the season. As far as the photos: My camera automatically adds the date and technical info (focus, shutter speed, and other stuff I never look at). 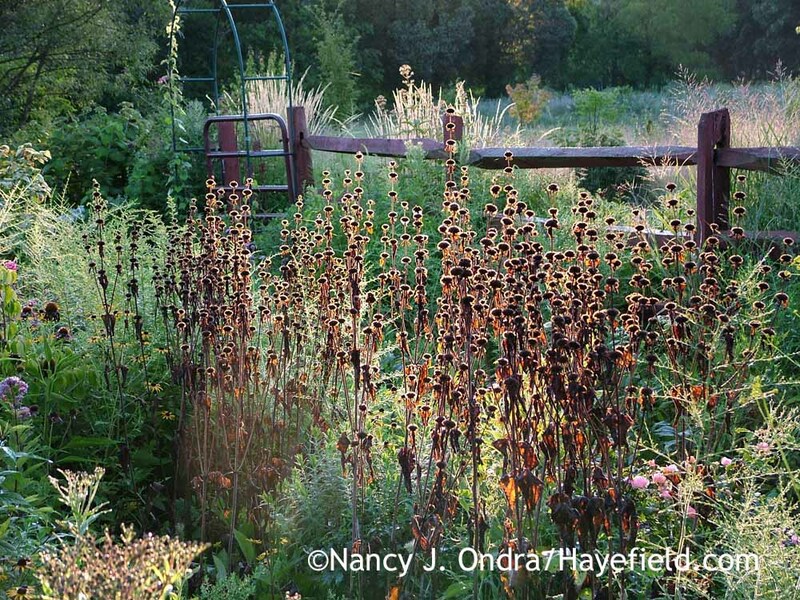 I spend a lot of time adding more useful tags: the botanical names, mostly, and the part of the garden, if that’s relevant, and sometimes other features such as backlighting, or colors, or ornaments. I explain more about that in Putting Words to Pictures. It takes me all winter to catch up with everything I shoot during the growing season, but it’s worth every second. There’s no way I could do most of these posts if I had to go through tens of thousands of photos each time! I highly recommend giving tagging a try. Hello back to all of you, from your counterparts in PA! We’ve been having June-like weather here, so fall doesn’t seem as far away as it otherwise might. 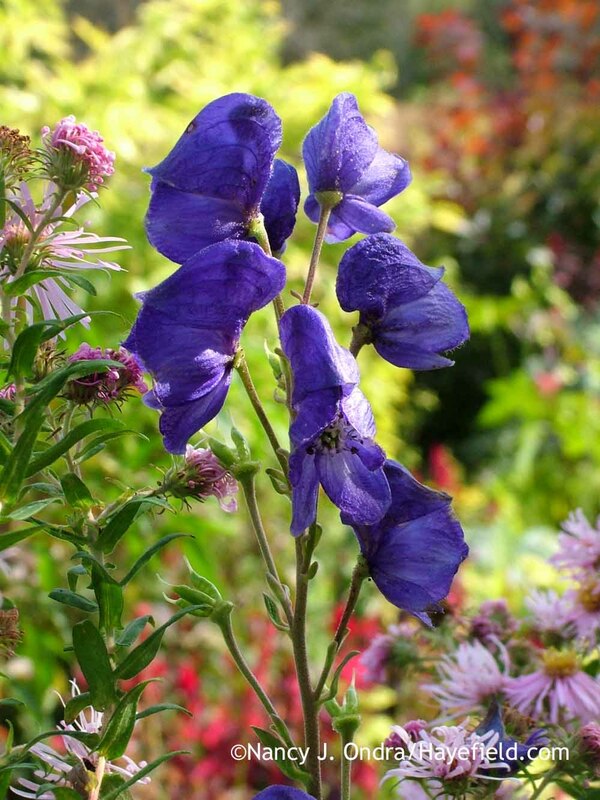 I have a feeling that the monkshood might not be happy in your conditions; I think our summers are getting a bit too hot for it even here. But, it could be worth a try. It really doesn’t take up much ground space, since it’s very vertical. Sounds like you have a busy year ahead of you, Sandy! Since you are taking photographs now, maybe you’d consider starting a blog? It’s a terrific format for keeping track of progress, and I have no doubt that others would benefit from your experiences. Best of luck to you!